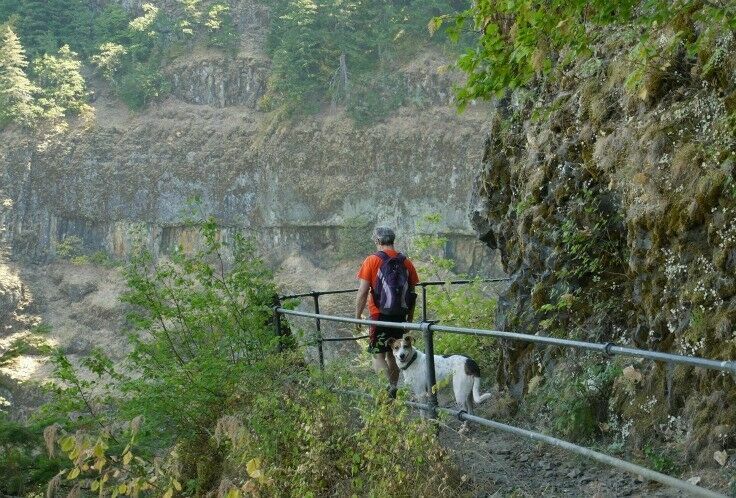 The Oneonta Gorge Hike in the Columbia River Gorge creates an indelible memory for those who brave the trail to get there. 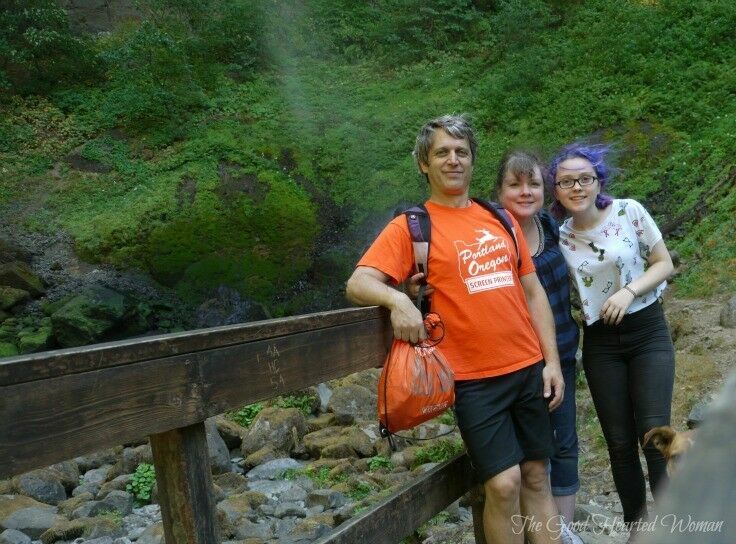 Oneonta Gorge is an amazing, invigorating hot-weather hike, and one of the most memorable that Mr B, Em and I have ever taken. 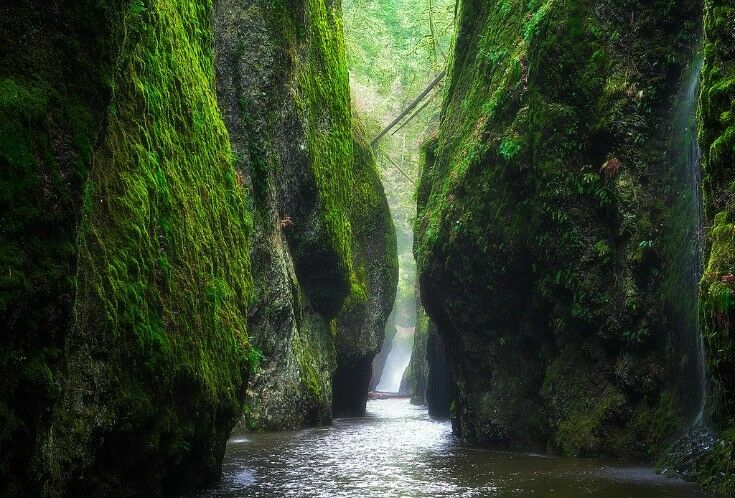 Arriving at the far end of Oneonta Gorge is totally worth the effort it takes to get there. When you stand at the end of that pristine fissure in the earth and feel the spray from Lower Oneonta Falls falling all around you, it is an incredible, indelible moment. 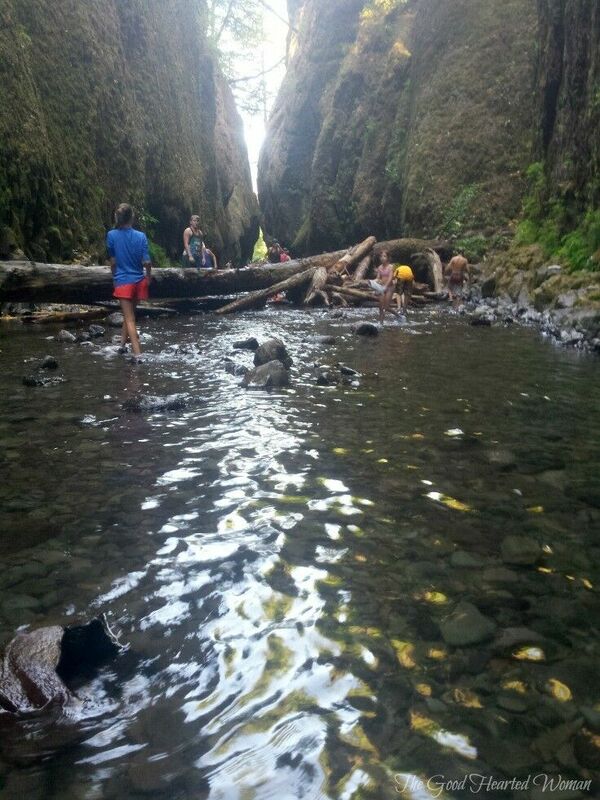 Just down the road from Oregon’s famous Multnomah Falls, the Oneonta Gorge “trail” is not a trail at all: you hike the creek bed. 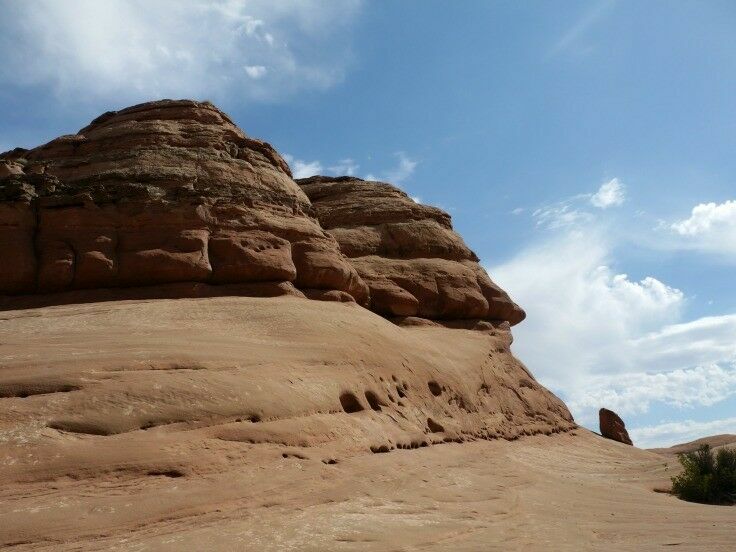 The hike itself is quite short – just over a mile round-trip. The challenge comes in the form of a GIANT log jam completely blocking the route into the Gorge. The only way through the log jam is to climb over it. It is very doable as long as you are reasonably flexible and keep a clear head; however, it requires some patience. After the long jam, as you continue walking the river bed, the water gets very deep at one point. It came up past my waist (I’m 5’3”), and considering we were there in August, I imagine that the water can be much deeper earlier in the year. The payoff at the end of the trail is the basin of Lower Oneonta Falls, a place that lends the feeling of standing in a world apart. 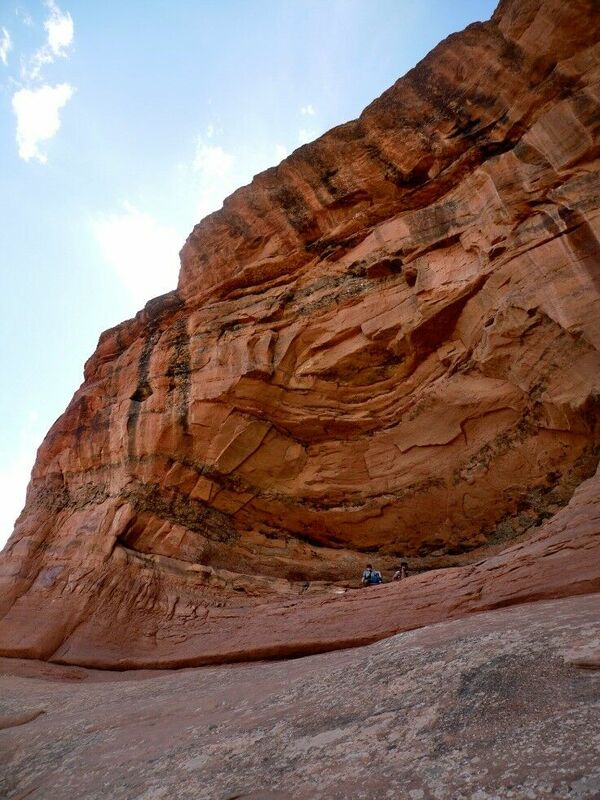 I highly recommend taking this hike; however, there are a few important things you need to know before you go. DO Wear water shoes with good tread. 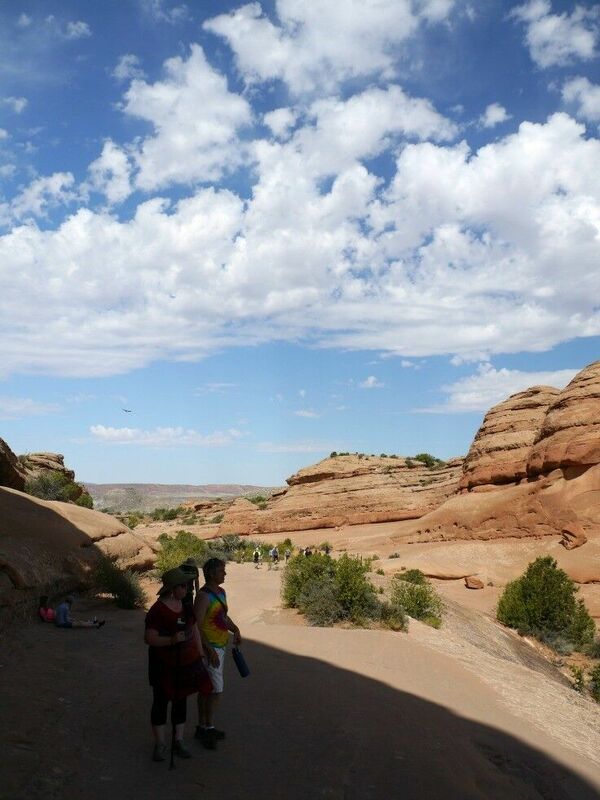 DO go hiking when it is hot outside. 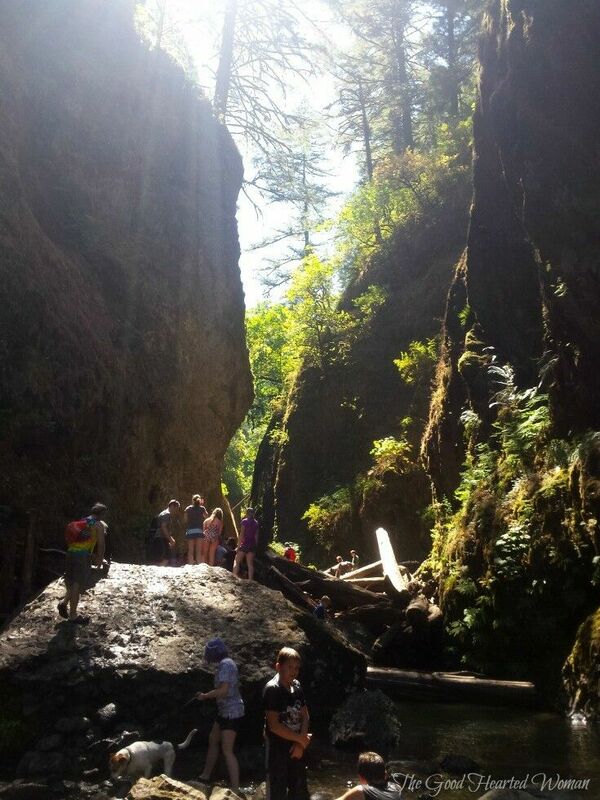 We took the Oneonta Gorge Hike in early August during a heat wave. At that time, it was refreshingly brisk in Oneonta Gorge, and yet the logs in the log jam were still very slick and slippery. Imagine how cold and wet it might be during one of our infamous PNW torrential downpours. 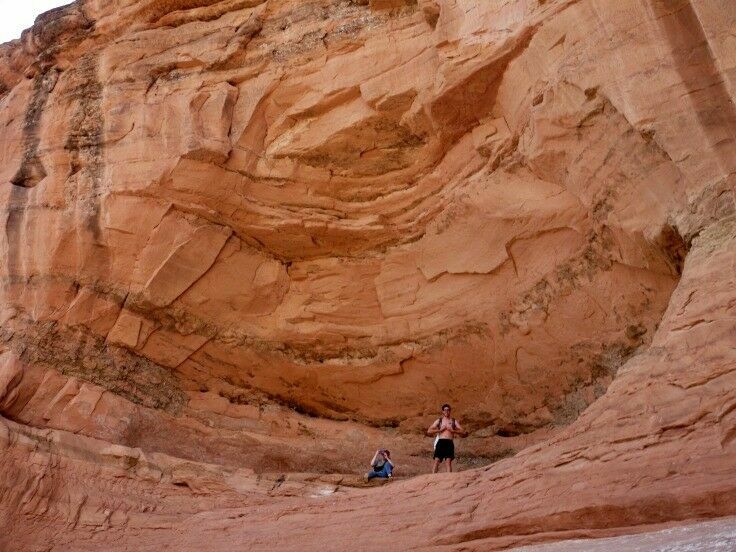 DO take your smart phone in a dry bag or a Ziploc bag, because you are going to want some pictures. I have this cool little dry bag for my phone that I bought when we went to Hawaii. It’s very sturdy, allows me to take clear pictures while my phone zipped safely inside of it, and I never have to worry about my phone getting wet. DO prepare to be surrounded by a lot of other people in close proximity. As an Oregon hikers, we are used to having the trail pretty much to ourselves, but there were TONS of people the day we went (a Thursday), and it can get especially up-close and personal while everyone is moving in different directions as they get over the log jam. DON’T bring your baby, your toddler, your puppy, or your mobility-challenged great-grandma. Just don’t. 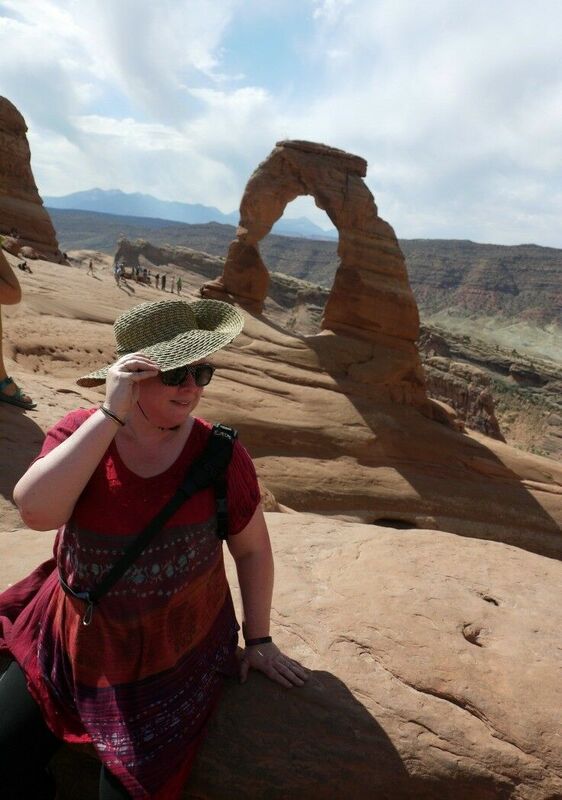 This might go without saying, but I’ll put it out there anyway: this hike is only for able-bodied folks. 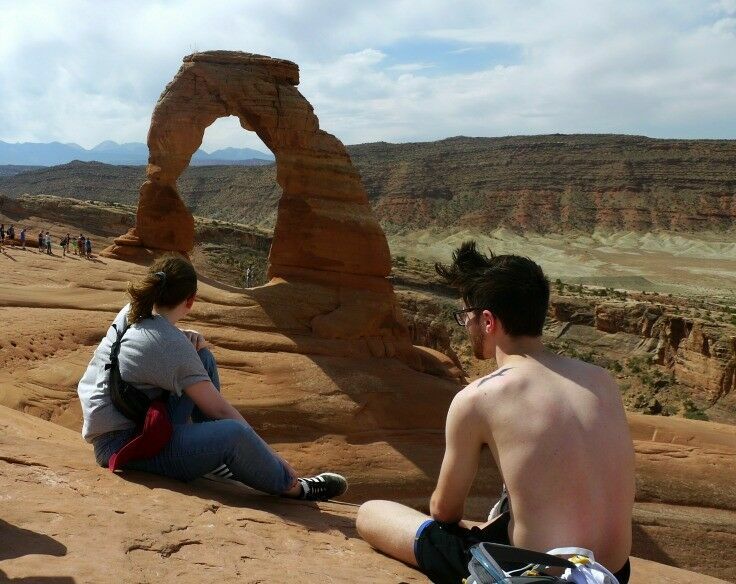 This is not meant to be exclusionary or discriminatory in any way, but we saw so many people (and animals) really struggling on this hike. I don’t mean that they were just out of shape (Me!! I am definitely out of shape, and I made it.) I mean they should not have been there in the first place.For example, we saw a man about a quarter of the way into the log jam trying to coax his hysterical two-year old over a log. 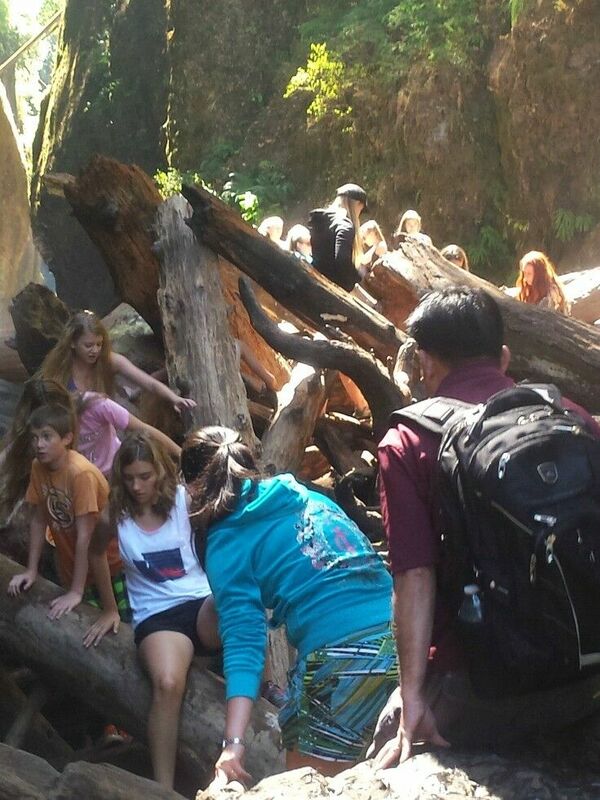 A crowd was patiently waiting, all balancing on slippery logs at least eight feet off the ground at the time, while we watched this poor kid, petrified and screaming at the top of his lungs. 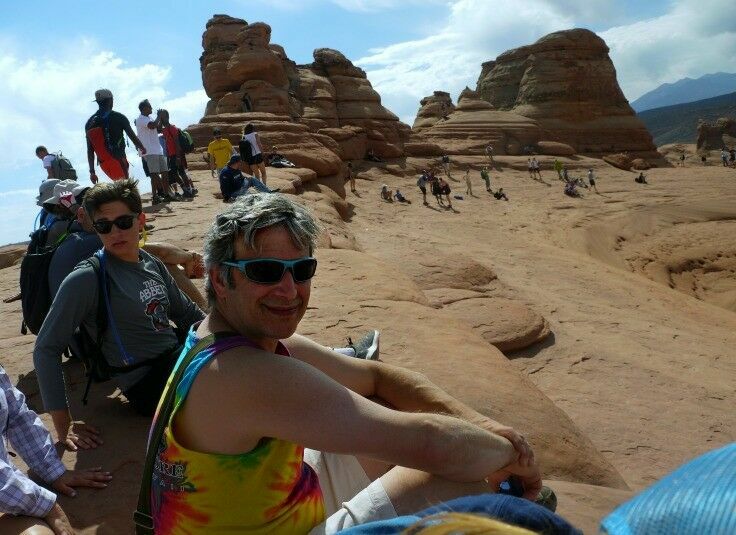 His dad was so intent on getting on with the hike that, though a few people gently mentioned to him that maybe he should try another day, he would hear neither friendly suggestions nor his own child’s pleas. Lesson here: sometimes you just need to Parent Up, turn around and go home. We also saw an adorable puppy shivering with cold and fear, legs wobbly in frigid water up past his chest. His people had tried to come prepared: the puppy had a canine flotation vest on with a handle, and they were hefting him over the logs, but he was clearly scared. When we saw him later up the creek bed, he was trying desperately to stay above water and shivering like a kitten in a snowstorm. 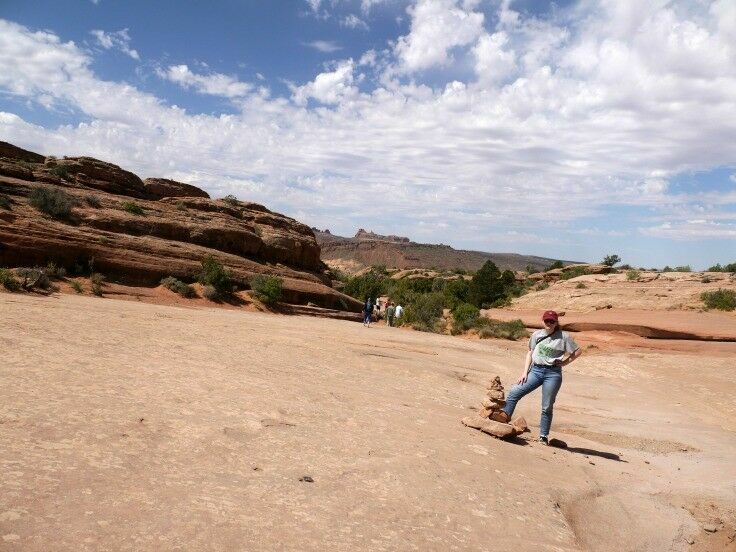 I am certain that many people have done this hike successfully with both pets and kids, but honestly, I just don’t think it is worth the risk or the emotional toll. 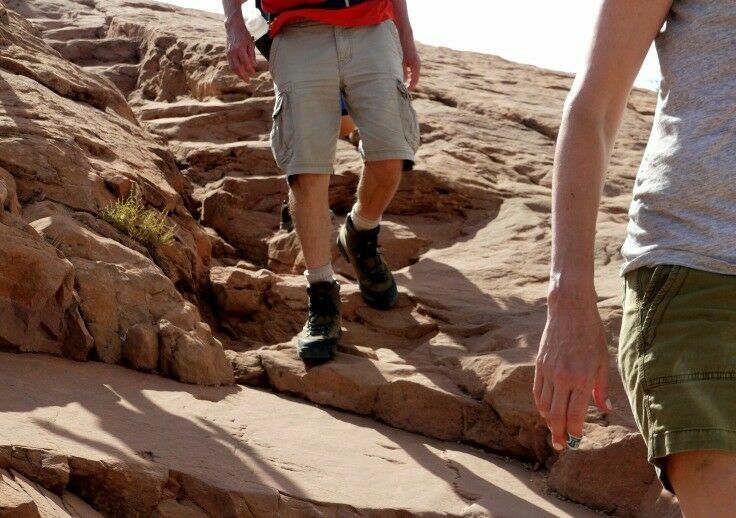 DON’T go barefoot, wear flip-flops, or shoes with no tread. DON’T drink/ingest/smoke/vape (or whatever you do) any mind-altering substances before you go. Seriously, Oregon, don’t play innocent with me. 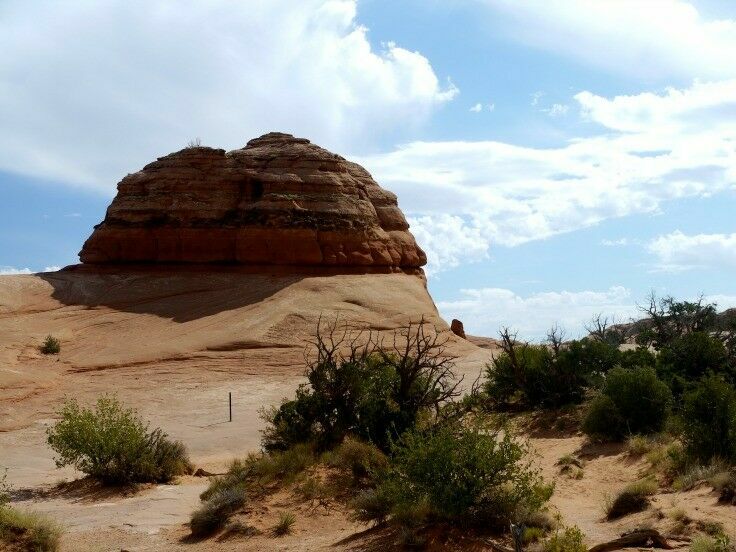 I know that at least a few of you are in the habit of enhancing your hiking vibe on occasion, and I’m not trying to harsh your mellow, but you really do need your wits completely on for this one. Stay straight and stay safe, folks. 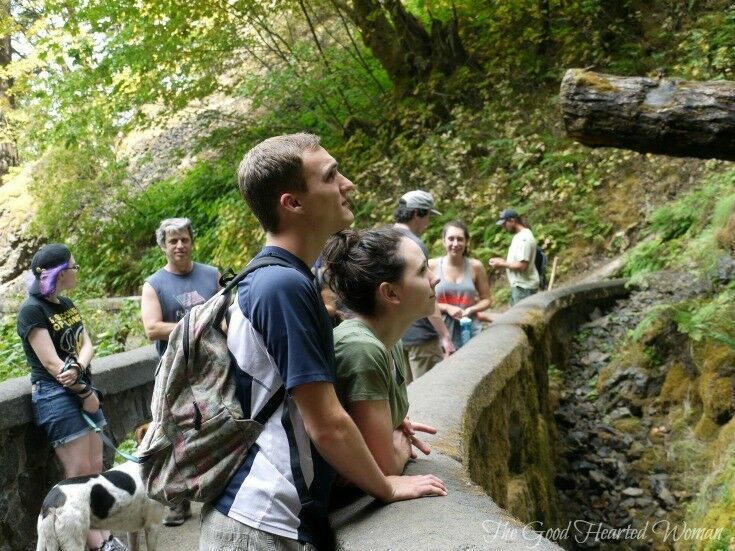 → Read what others have to say about Oneonta Gorge on TripAdvisor. 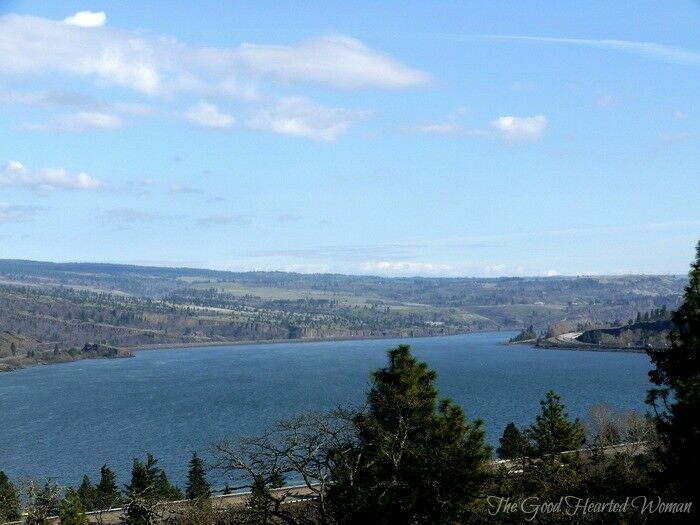 From I-84, take Exit #35/Ainsworth and head west on the Historic Columbia River Highway for approximately 1.5 miles. Just east of the Oneonta Tunnel on your left/south is the Oneonta Gorge. Parking is limited. It was a miner ’49er named Carleton Eugene Watkins, originally on the West Coast for the California gold rush, who first photographed the area, and it was he who gave the gorge its unusual name – “Oneonta” after his hometown of Oneonta, New York. Disclosure: This post may contain affiliate links, which means we may receive a commission if you click a link and purchase something that we have recommended. While clicking these links won’t cost you any extra money, they will help us keep this site up and running – and (relatively) ad-free!! Please check out our disclosure policy for more details. Thank you for your support! 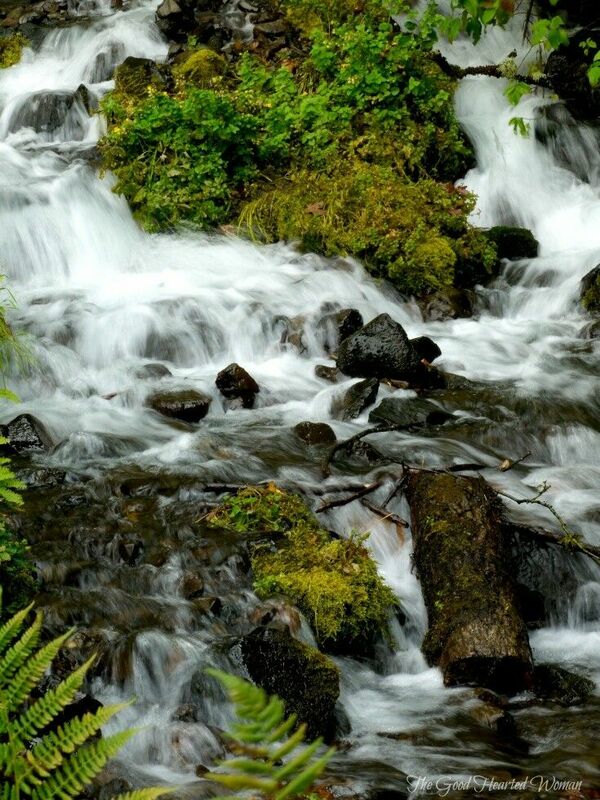 Beautiful and easy to access, Wahkeena Falls is one of the most popular destinations in the Columbia River Gorge. 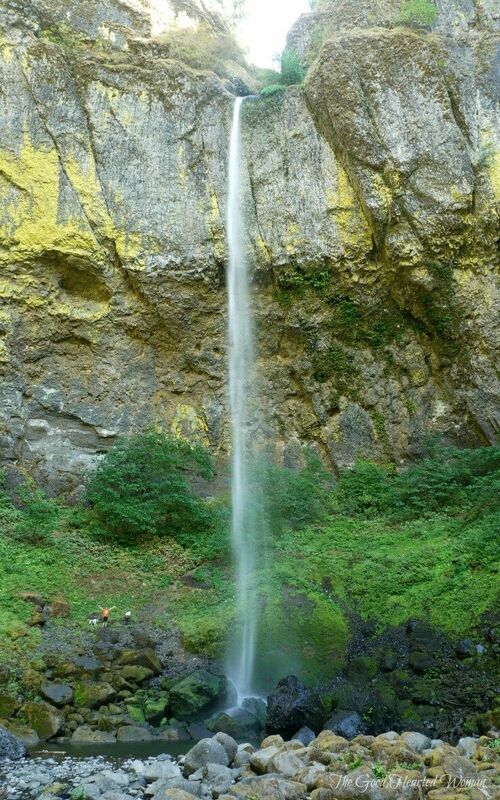 The Columbia River Gorge offers visitors almost an infinite hiking opportunities. 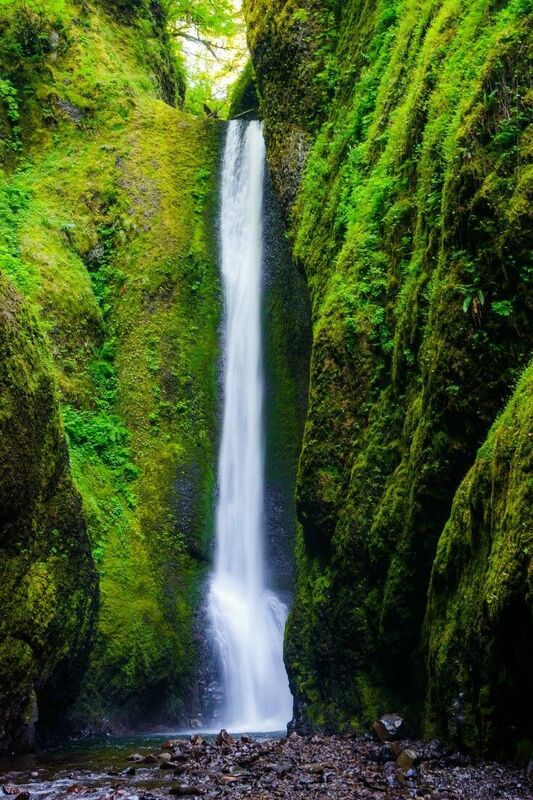 Some of our favorite day hikes can be found along the string of waterfalls on Oregon’s Historic Columbia River Highway known as the “Waterfall Loop,” where well-maintained trails are abundant and the scenery is spectacular. 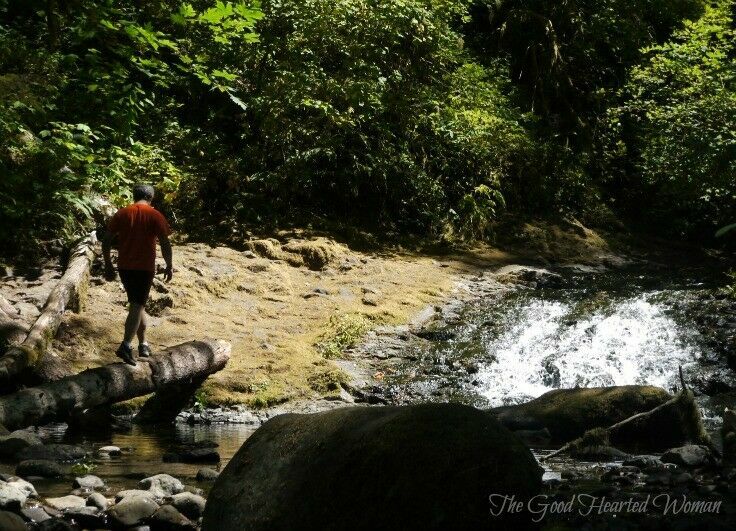 The hike to Wahkeena Falls is especially beautiful, with something to see around every bend in the trail. Unlike Multnomah Falls and many of the other falls on the waterfall loop, Wahkeena Falls is not a single, straight fall, but rather a series of steps, horsetails, and plunges between basalt outcroppings as Wahkeena Creek makes its way down to the base of the falls and on to the Columbia River. Wahkeena Falls, once known as Gordon Falls (for F.E. 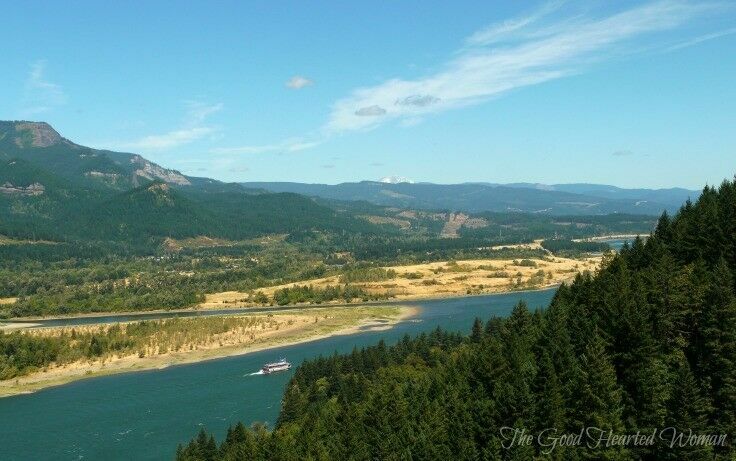 Gordon, a pioneer landowner), was renamed in 1915, after the completion of the Columbia River Highway. 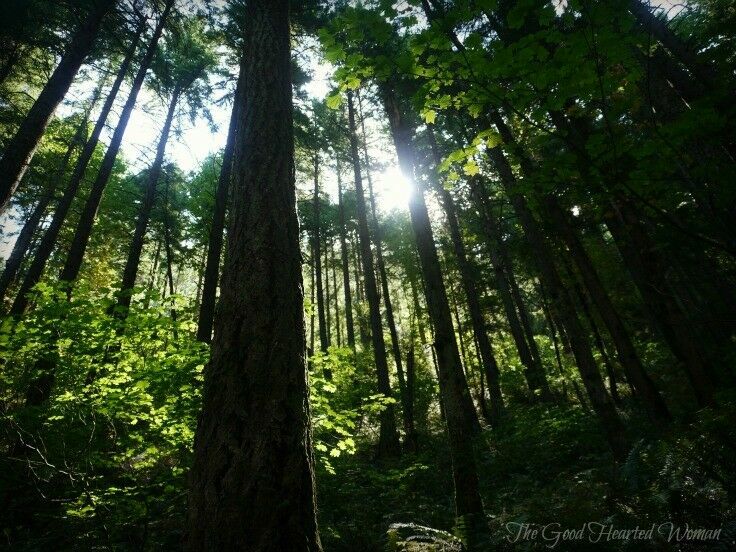 Wahkeena – a Yakima Indian word meaning “most beautiful” – is a fitting name. 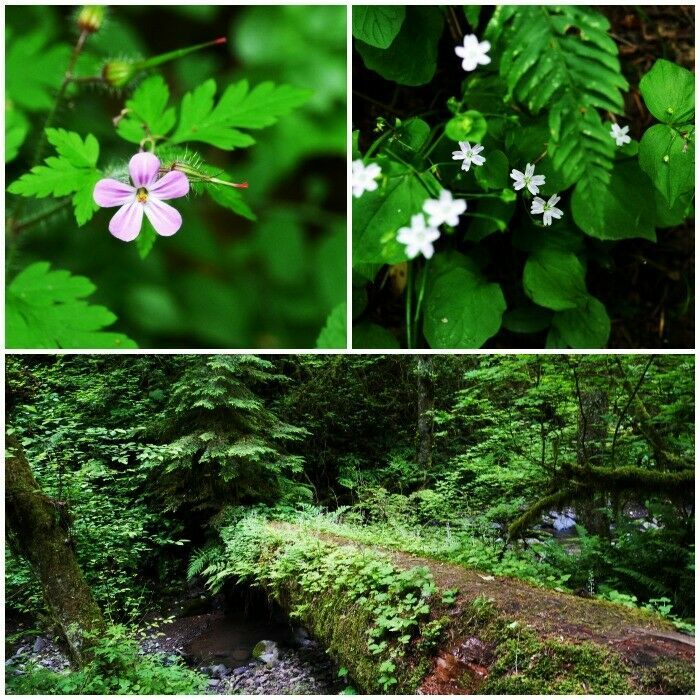 The hike to Wahkeena Falls is moderately easy, and although the trail offers a bit of an upward climb going in – a 400 feet gain in about a half mile – it is well worth the effort. 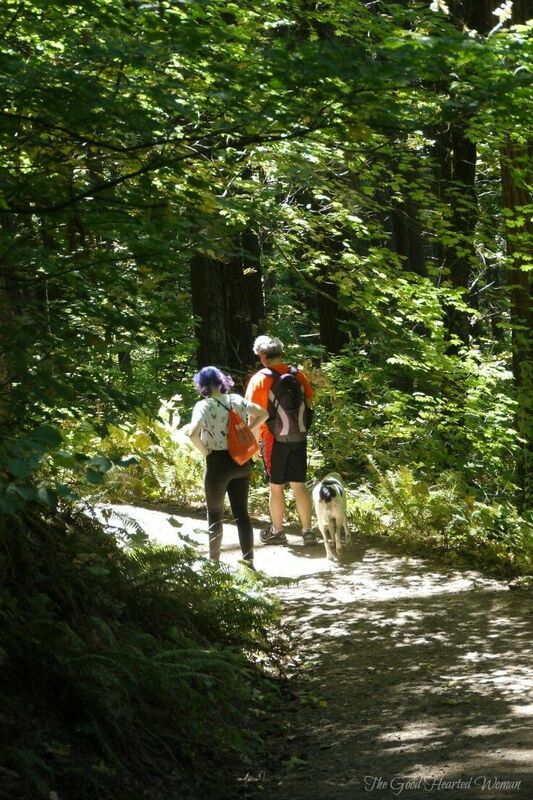 From beginning to end, the Wahkeena Trail (#420) rewards day hikers with beautiful views. 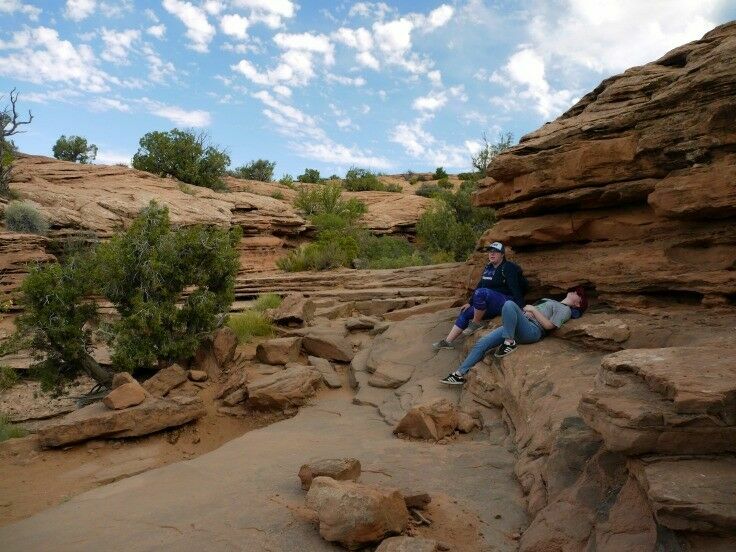 There is a short .2 mile paved hike to the lowest stage of the falls that’s popular with families and folks who aren’t up to hiking to the top. There is even a nice little stone bench if you want to sit down and take a break. 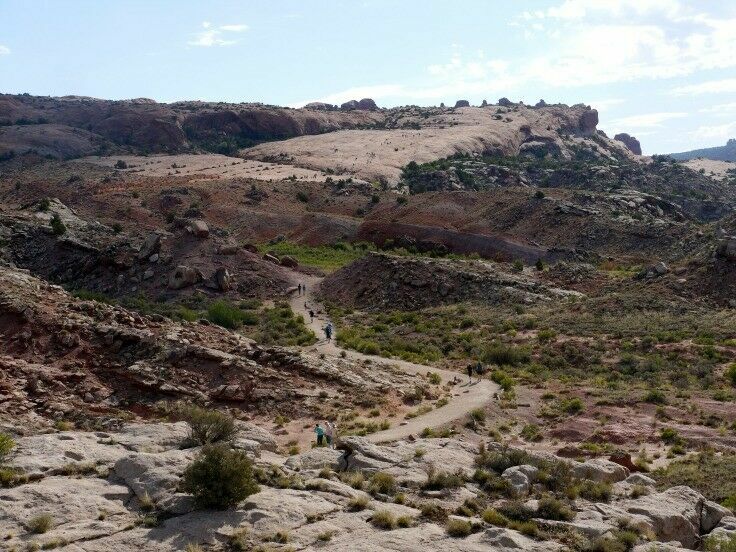 From there, the trail takes you through about a dozen switchbacks with a steep rise in elevation that will seriously challenge your calves if you’ve avoiding the gym lately. 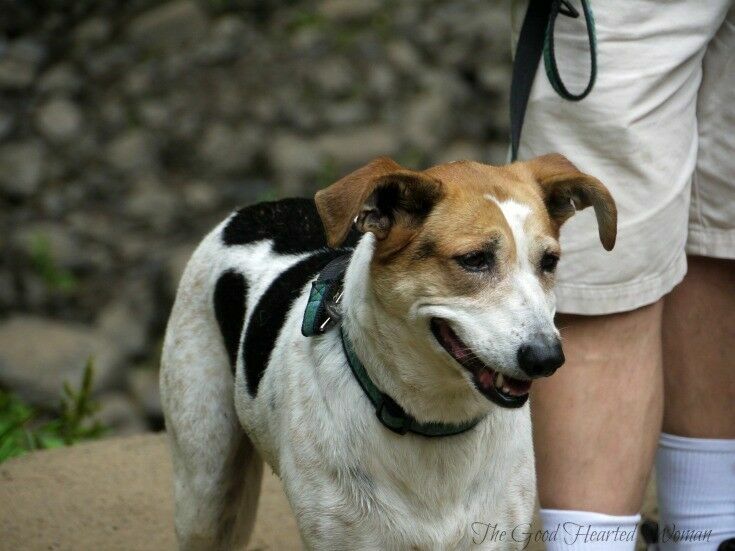 The trail is wide enough to walk side-by-side with a hiking buddy, and very well maintained. 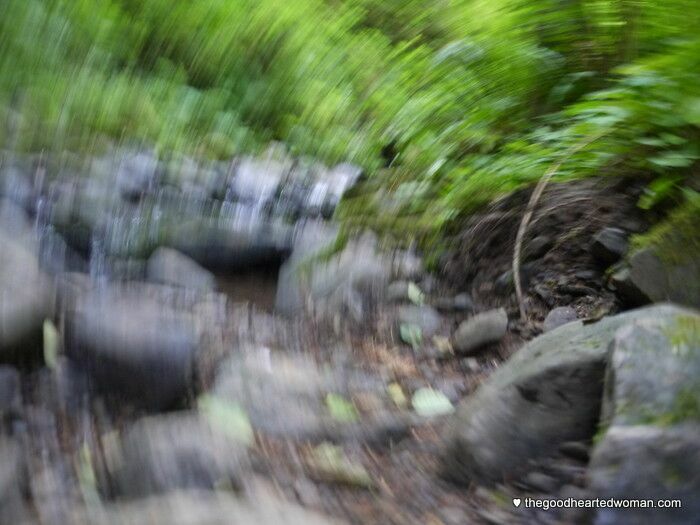 Like most of the trails in the waterfall loop, there are many interconnecting links, so be sure to mind the “street signs” that you see along the way. Am I the only one who thinks this is funny? 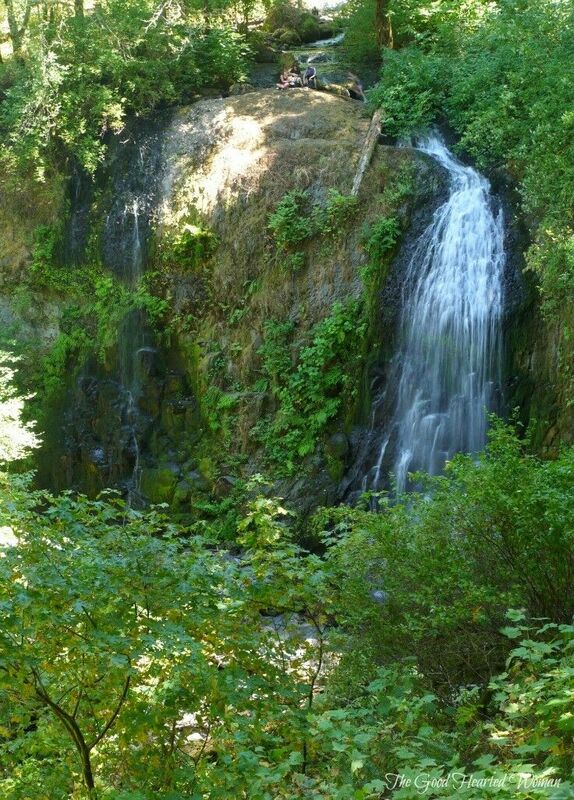 Read what others have to say about Wahkeena Falls on TripAdvisor. From Portland head east on I-84 and take the Bridal Veil (Exit 28). 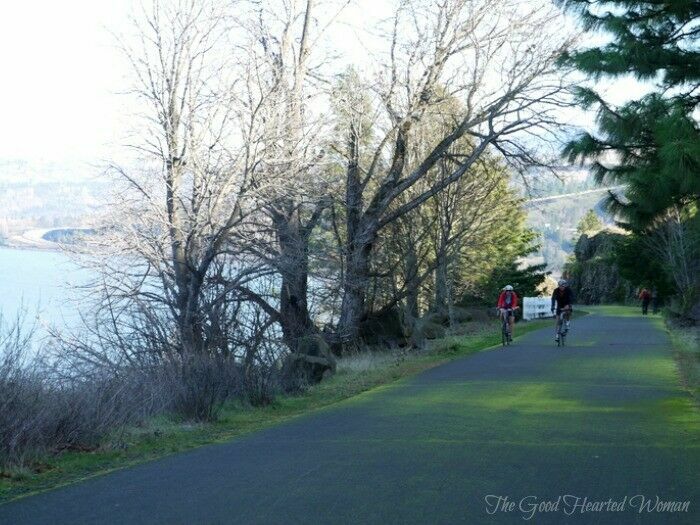 At the Columbia Gorge Scenic Highway, take a left heading east and go approximately 3 miles, just before Multnomah Falls. There is parking on both sides of the highway, and the trail head is on the south side of the highway, heading west. There is another trail that connects this trail head to Multnomah Falls, heading east. 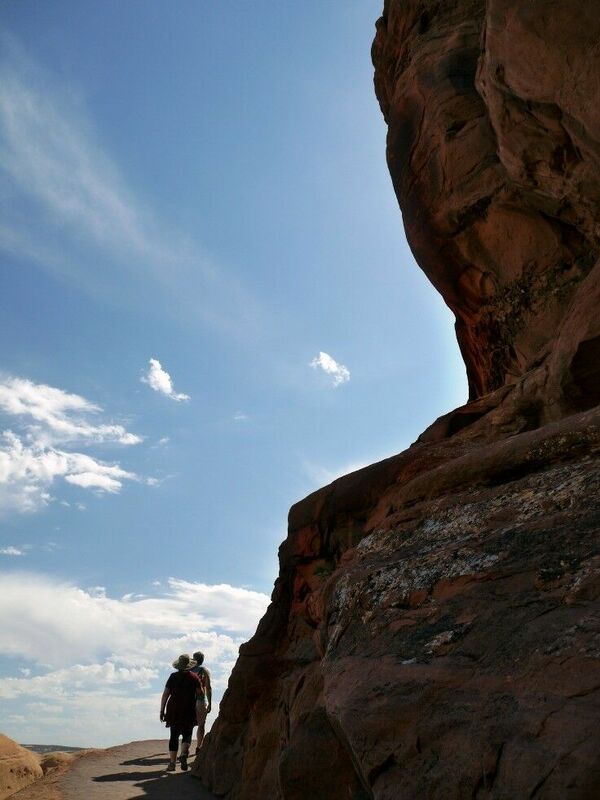 It can be so easy to put off exploring your own backyard. 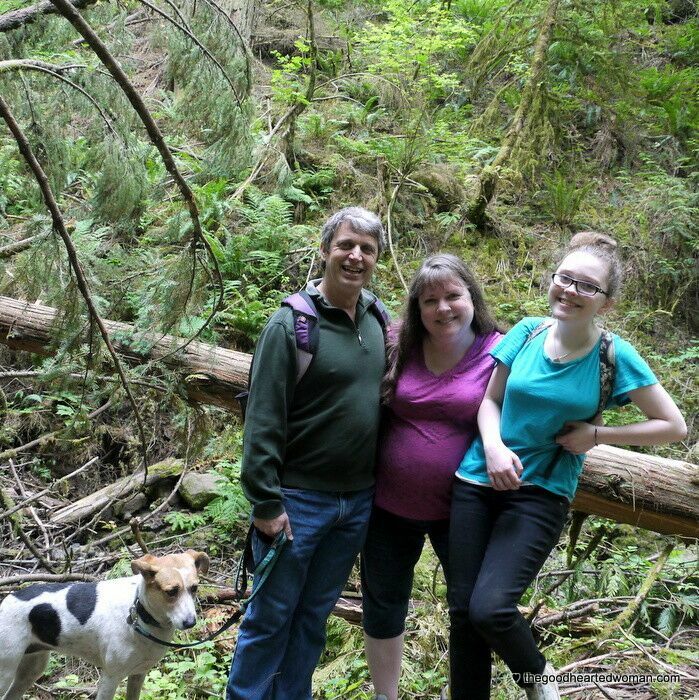 Late this summer, Mr. B, Em and I decided to spend a week camping along the Historic Columbia River Highway at Ainsworth State Park, and take the time to explore Gorge trails so close to home that we often overlook them. I believe him. 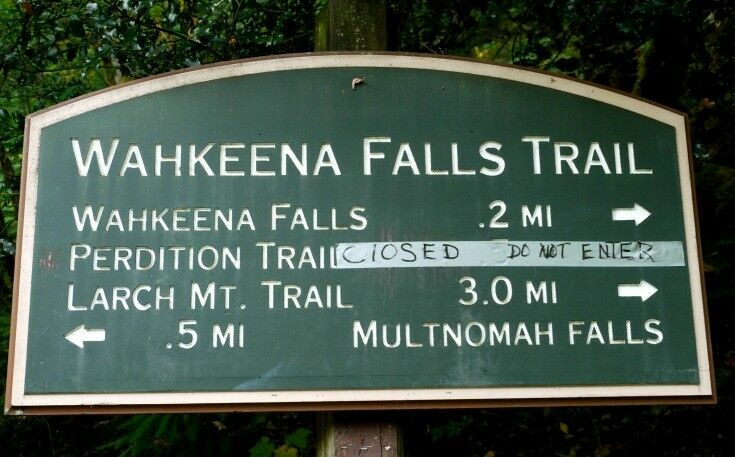 If you have ever hiked to the top of Multnamah Falls, you probably had a lot a company along the trail. 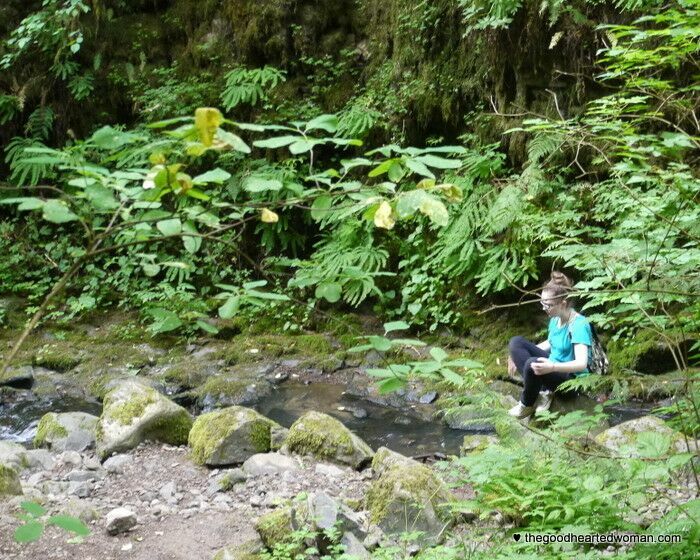 Not so on the Elowah Falls and McCord Falls Hike. I could count the number of people we encountered the entire time we were on the trail on two hands. 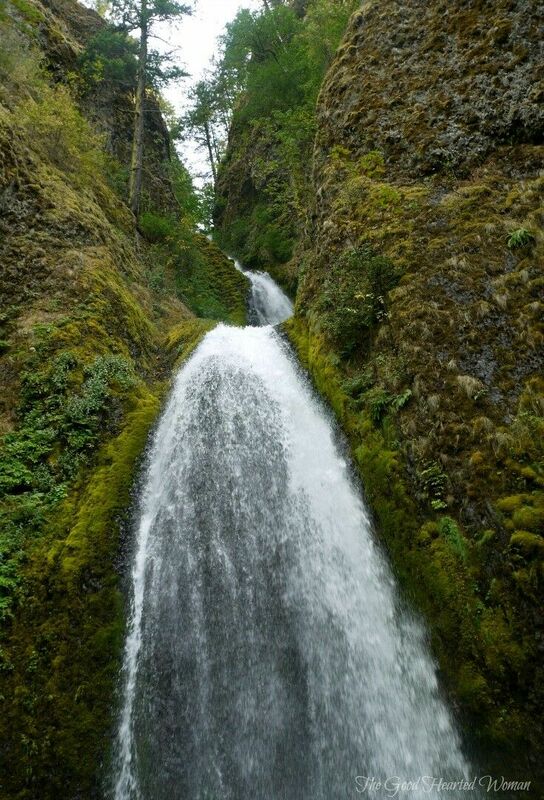 The Elowah Falls hike is actually two hikes in one. 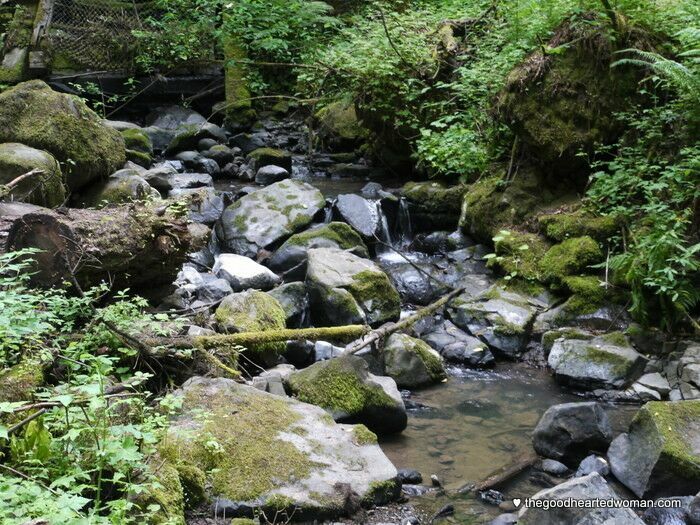 About .2 miles in, at the second junction in the trail, you can choose to go up to Upper McCord Creek’s twin waterfalls, or down to Elowah Falls. We took the high road first. 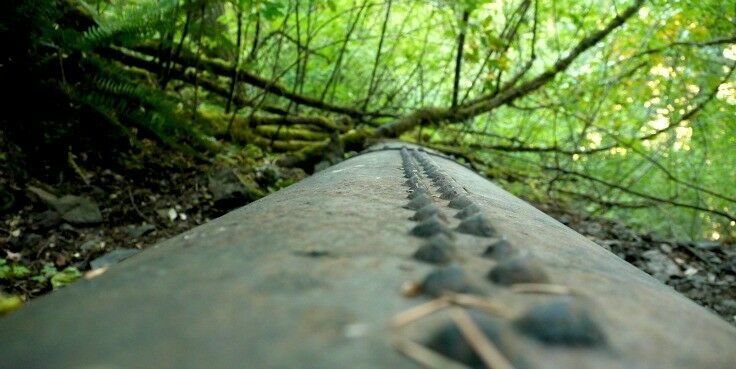 A short way into our hike, we encountered a rusty piece of history – this long cast-iron flume pipe running down the hill. 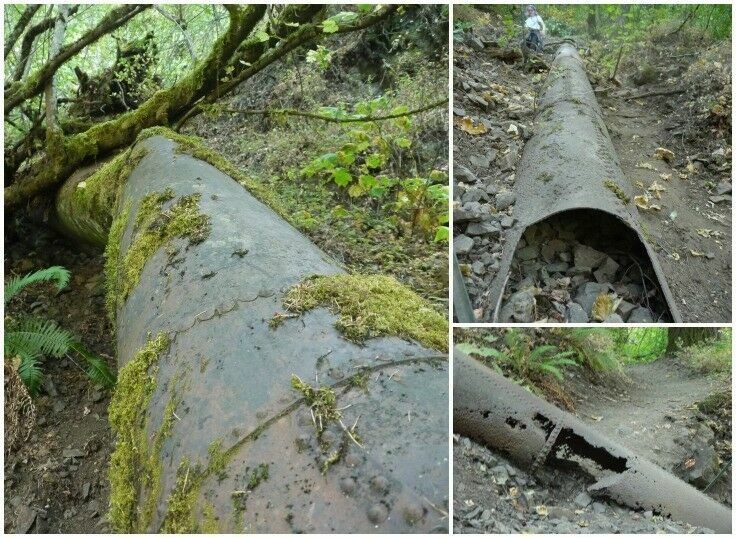 According to Cook, this flume was built circa 1890 by pioneer Myron Kelly, who used it to deliver pressurized water from McCords Upper Twin Falls to his pulp mill down on the river. The pressurized water turned mill wheels that ground cottonwood trees into pulp, which he sold to Camas’ paper mills. 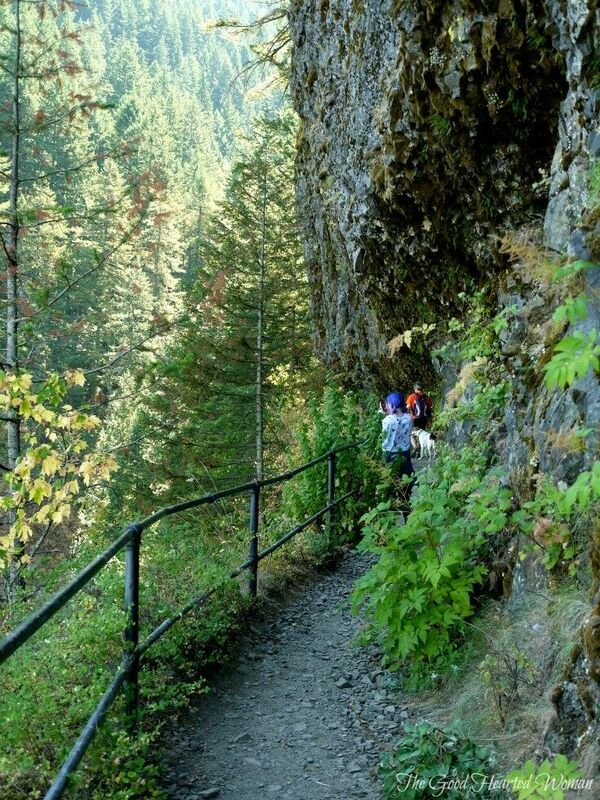 The mile-long trail to McCord Creek Falls makes several switchbacks for an elevation gain of 260 feet. 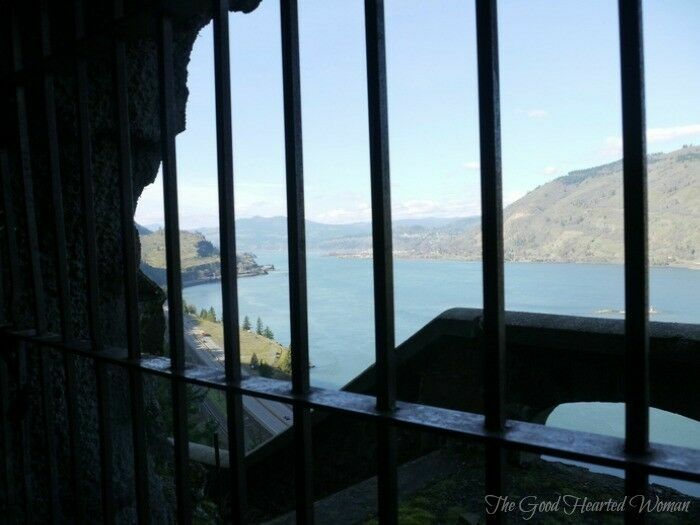 It also passes a basalt wall blooming with wildflowers, and gives you a beautiful view of the Columbia River and Hamilton Mountain across the river in Washington. If you’re lucky, you might even catch a glimpse of the Columbia Gorge Sternwheeler making its way up (or down) river. 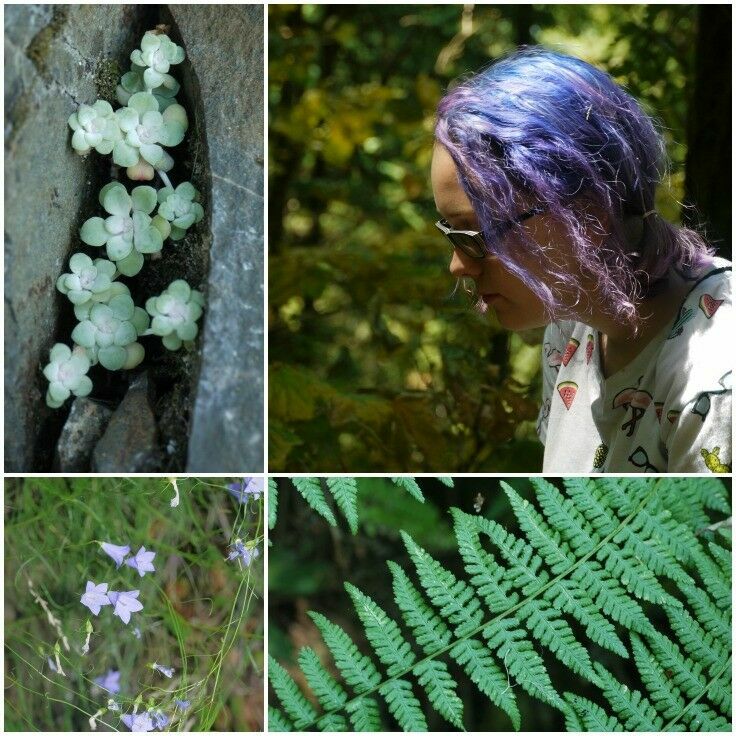 We stopped at McCord Creek Twin Falls to eat lunch, and Mr. B and Em did a little exploring while I took pictures of the local flora. 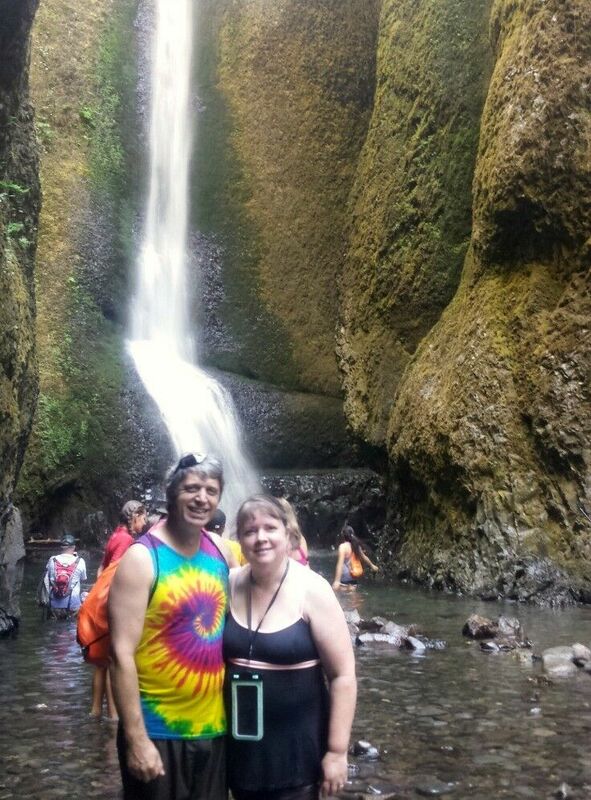 After lunch, we returned down the trail to Elowah Falls. 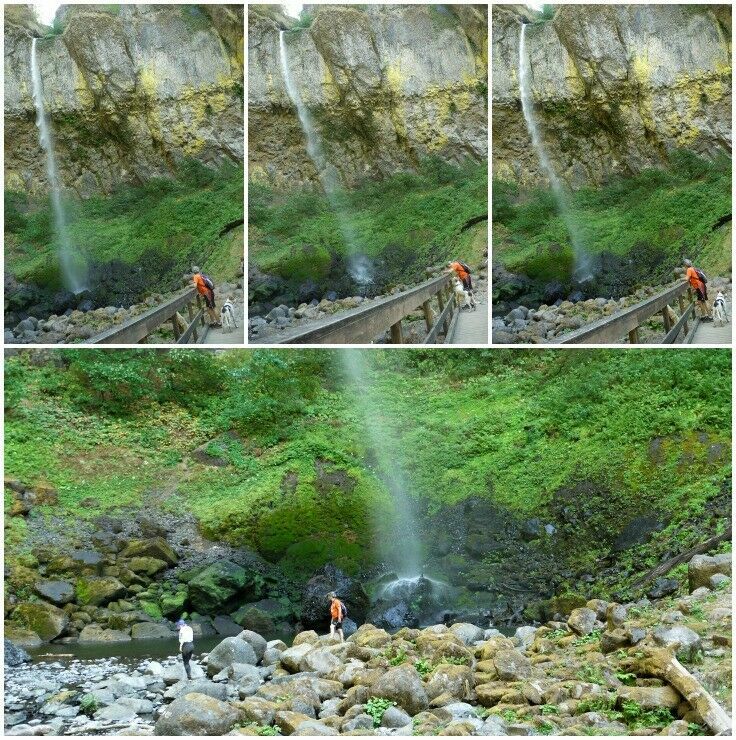 The falls are fed by runoff from Mount Hood and, due to our extremely dry summer weather, the 213-foot high waterfall itself was somewhat anticlimactic, but nonetheless lovely, and the spray was quite refreshing after our hot afternoon hike. 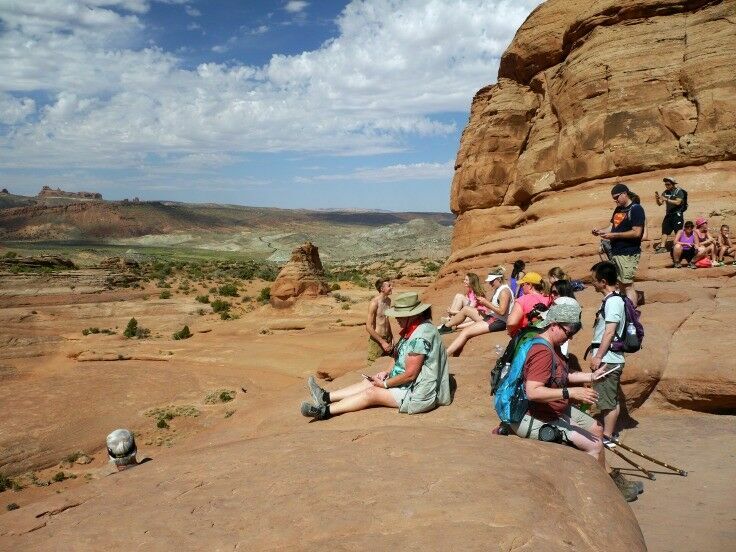 We’re hoping to take the hike again in early spring when the water is flowing more. The canyon created by the falls creates a wind tunnel, and as we got close to the falls basin, the wind became strong enough to push the weak waterfall flow sideways. 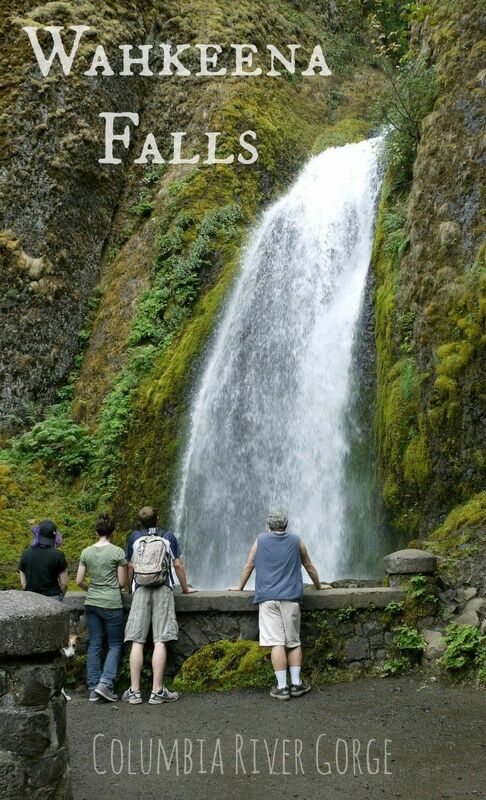 If you are looking for a great, easy hike, we highly recommend checking out Elowah Falls. 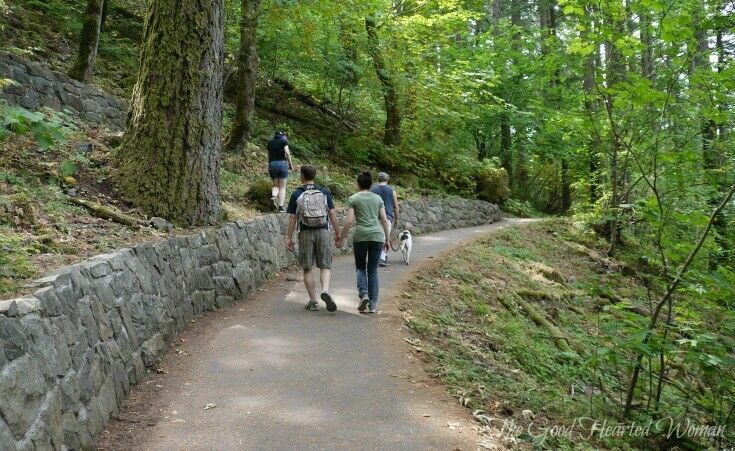 From Portland, it makes for a beautiful day trip, and if you are looking to get a little one-on-one time with the people you love along the way, the trail will be all yours. 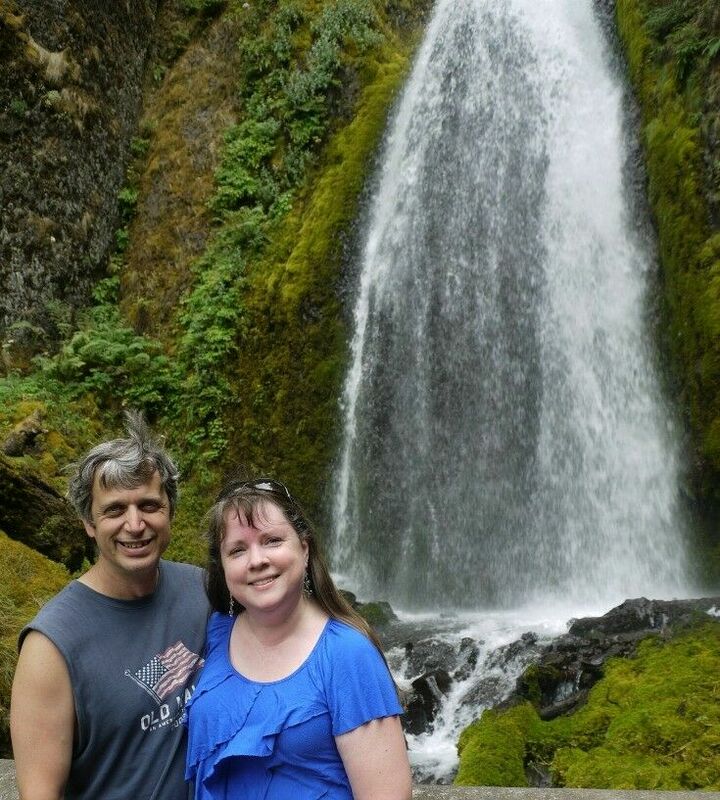 .75 miles to Elowah Falls, 1 mile to Upper McCord Falls, and 3.5 miles to do both. Trail is very well-maintained, but rocky. Wear good shoes. Pets are OK. Leashes required. The parking lot really isn’t that hard to find. It’s just that it is situated east of the place your normally return to the highway from the old Historic Highway, and I think people just don’t know it’s there. (All the better for us solitary hikers then, huh?) 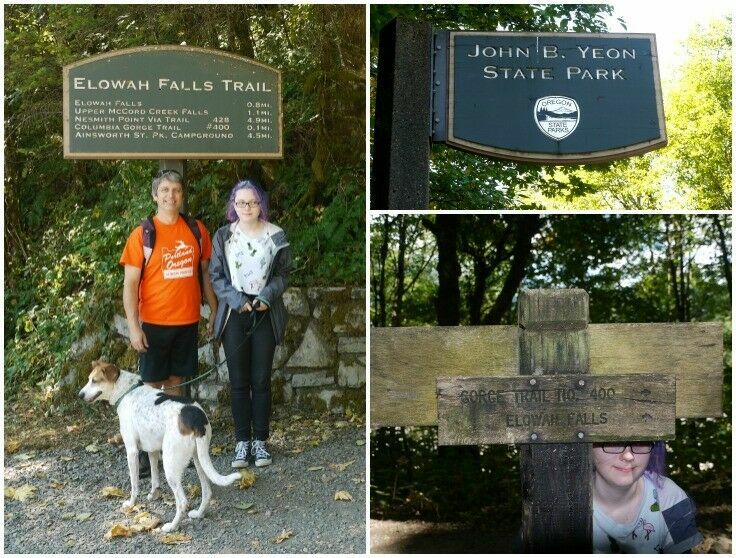 The trailhead starts in the parking lot of John B. Yeon State Park, making this the most easterly of the Historic Highway’s waterfall hikes. From Portland, take Hwy 84 east to Ainsworth exit 35. At the stop, turn left, and then immediately right onto Frontage Road. Follow for 2 miles to Yeon State Park (just before the highway entrance). Take I-84 west to Warrendale exit 37, Take the exit and go .3 miles, then turn left under the bridge. Take another left onto Frontage Road and head east for .3 miles to Yeon State Park (just before the highway entrance). 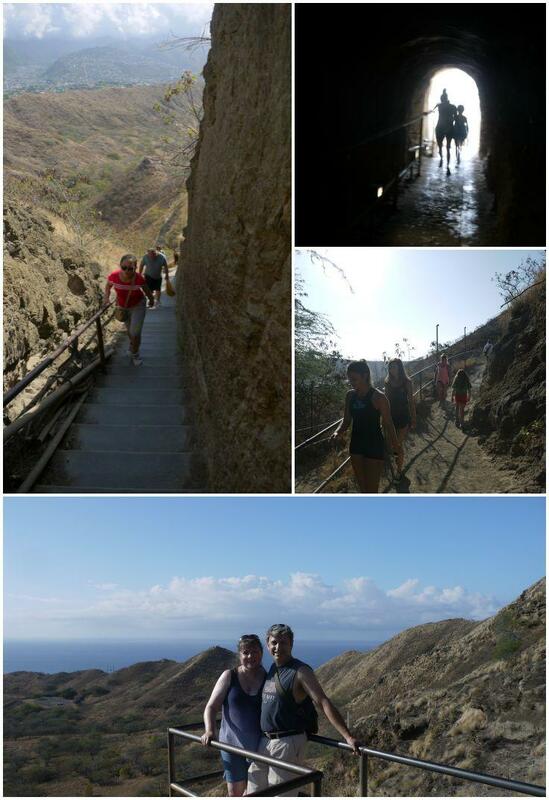 Hiking to the peak of Diamond Head Crater is no stroll through the park, but Wow! What a payoff! No, I am not sunburned in the picture above. I’m just one of those people who doesn’t sweat much, overheats easily, and turns red any time I my heart gets going faster than my feet. Now that we have that out of the way, let me tell you why we are smiling from ear to ear. 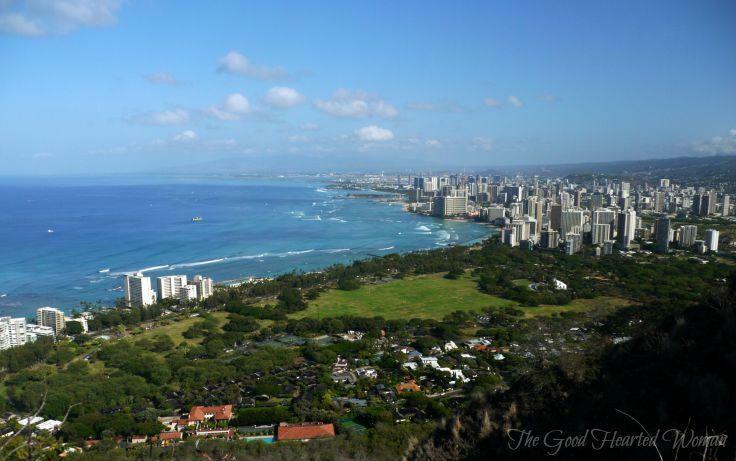 Or better yet, let me show you – from our vantage point at the top of Diamond Head Crater. 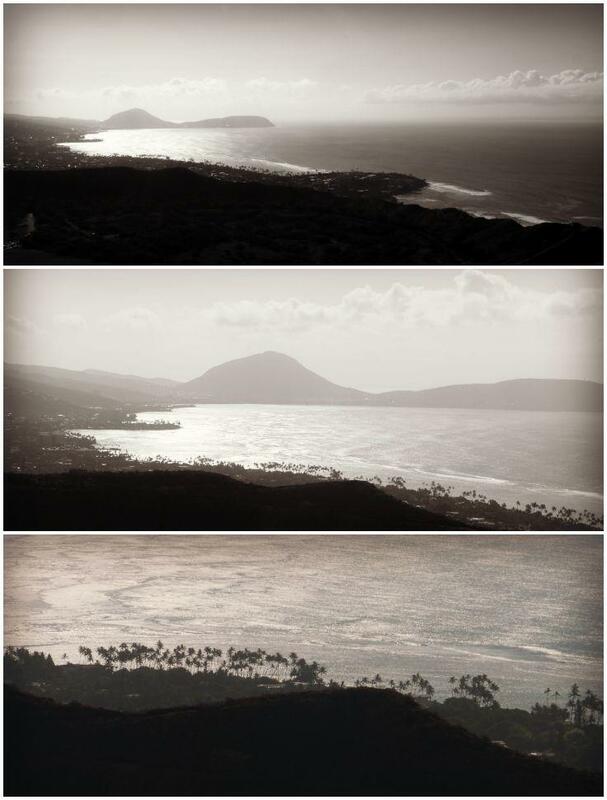 Looking to the right, Honolulu stretches west, and beyond it, Iroquois Point and the inlet to Pearl Harbor; and farther in the distance, the southwestern tip of Oahu. 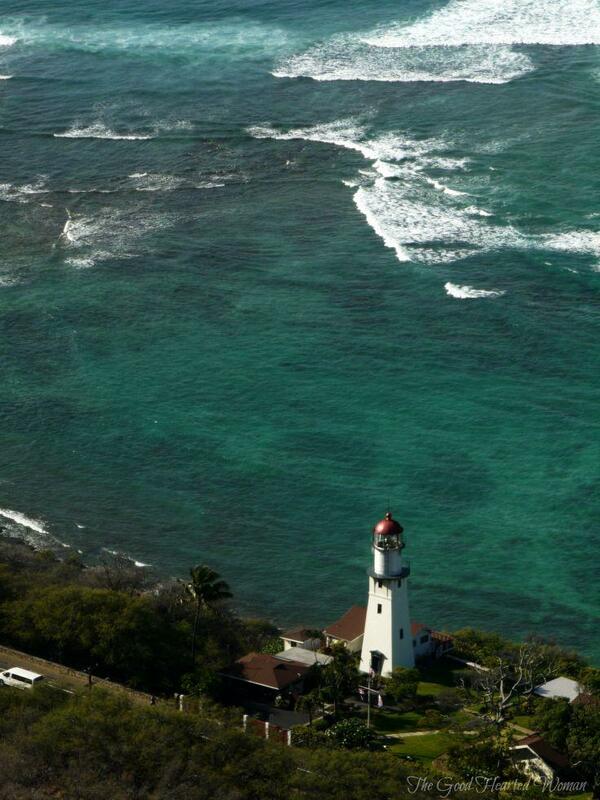 Now we look down, and about 700 feet below us stands the Diamond Head Lighthouse. The original lighthouse was built in 1899, and the current structure, erected in 1917, stands 147 feet above sea level and uses the original 1899 fresnel lens to projects its light 18 miles out into the Pacific Ocean. 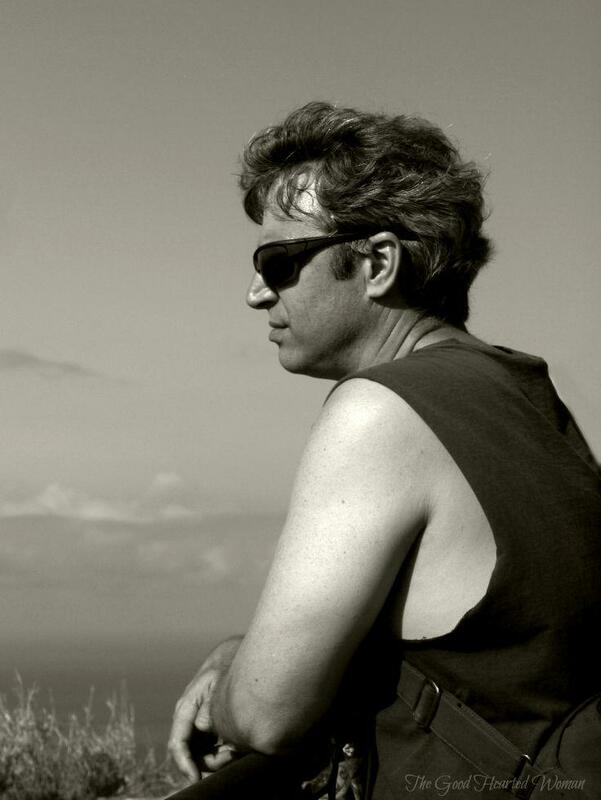 And then to the east, and beautiful Maunaloa Bay. To sum it up – 360° of Amazing. 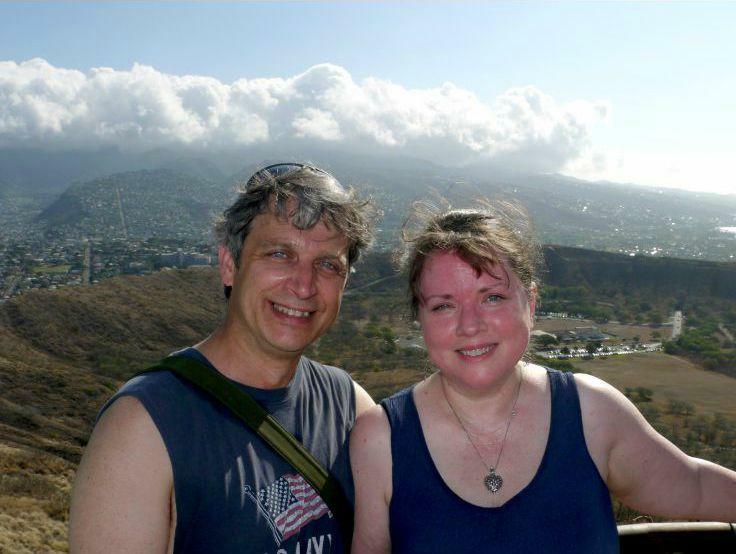 Here’s a few tips for making a successful trip up one of Hawaii’s most famous landmarks. 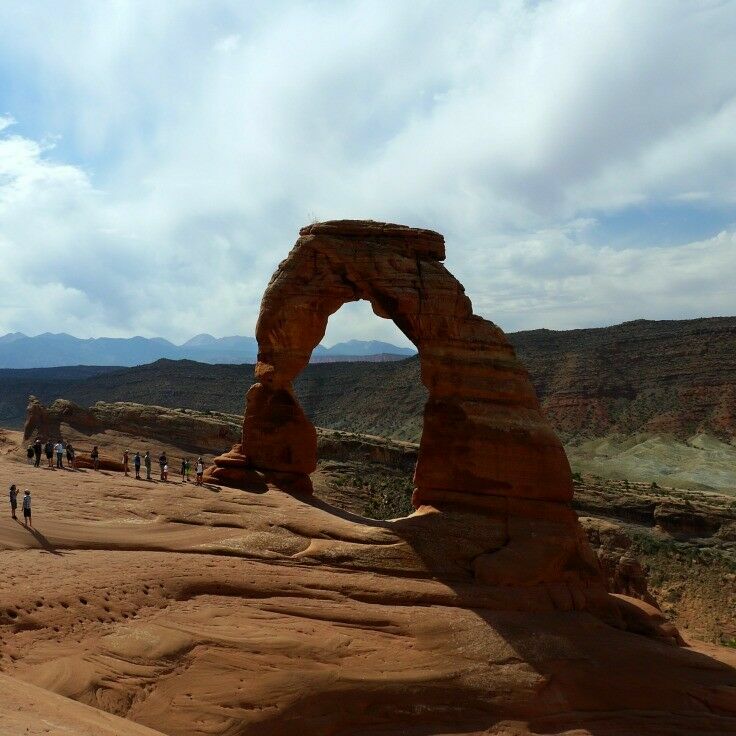 The park is open from 6am to 6pm seven days a week. Thousands of people visit each day, so getting there early can help you avoid the crowds. But that’s not the biggest reason. In my book, it’s all about the Heat. You are walking up the side of a extinct volcano here folks! There is very little shade, and it gets hot early. 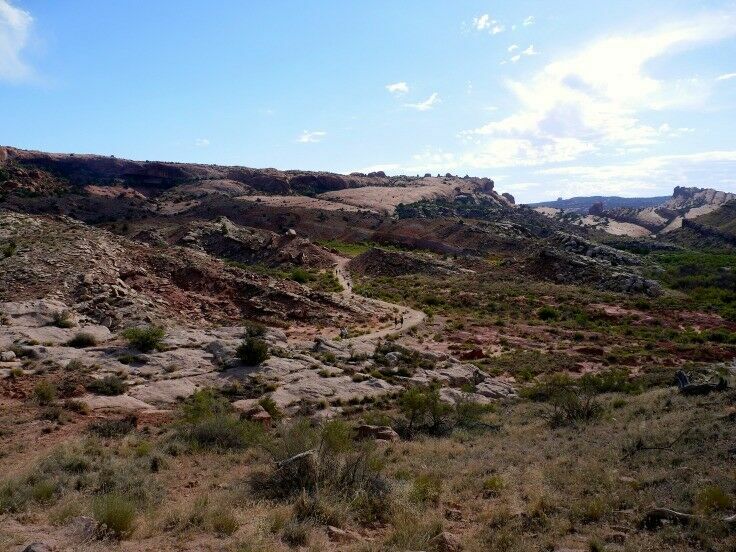 The first 0.2 miles of the 0.8 mile trail are all paved, but beyond that, the trail is rocky and uneven. There are steep stairs and narrow tunnels to navigate as well, and many sections of the trail are only wide enough for one person. Needless to say, leave the stroller in the car and Great-Grandma at the hotel with the air-conditioning on. It was surprising to me how many people didn’t have water with them. The reason I noticed is because they were suffering, many obviously in need of a drink. If you have the means, freeze a bottle the night before so that it will stay cold. Once you leave the parking lot area there are no restrooms, water or other services available. 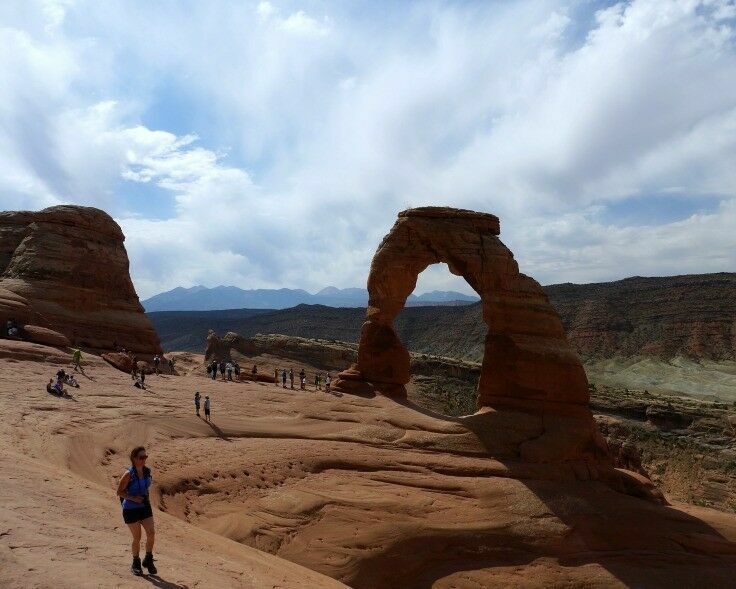 According to the park service, when it’s hot and humid, people who don’t hydrate enough frequently need to be carried out, and because of the terrain that often means a helicopter rescue. And while a helicopter ride over Oahu sounds fabulous, I wouldn’t want to take it while lying flat on the floor of an National Guard medical helicopter with an IV stuck in my arm because I forgot to bring a water bottle. Enjoy the experience. If you find that the pace you’ve set is a little too ambitious, slow down. This is an adventure, not a race. 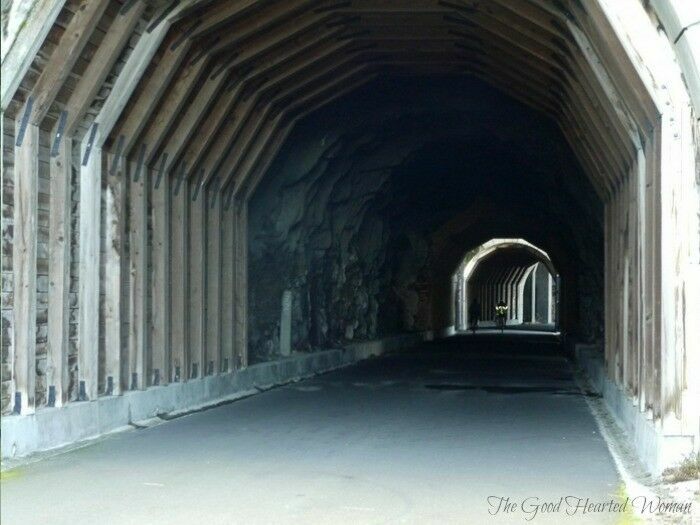 There are a couple of tunnels that you will need to go through; the longer is 225-feet long. 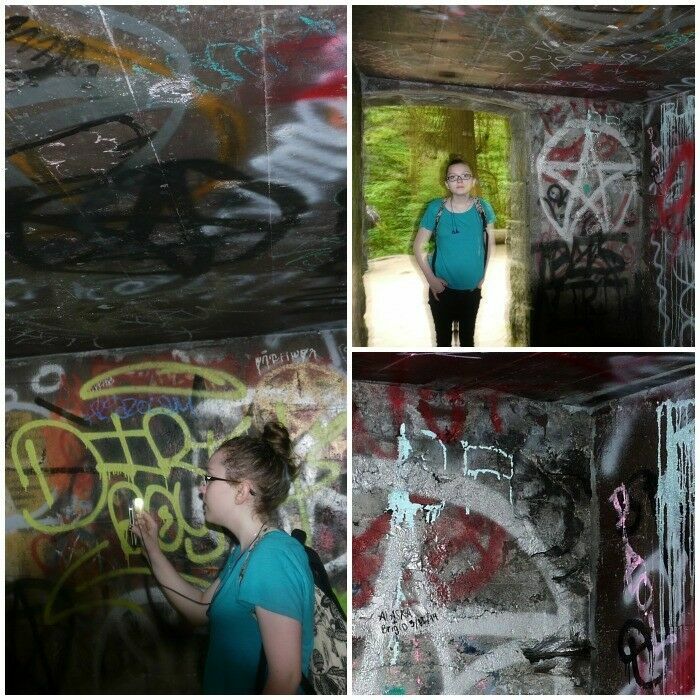 I have a very mild case of claustrophobia, and this tunnel was a bit of a challenge for me. However, you never lose sight of light, and that helps a great deal. There is also a quite daunting 99-step staircase: I’m out of breath just remembering it. I was intrigued with how the outline of the palm trees that lines the coastal highway contrasted with the water, and found myself momentarily wishing for a longer lens. I took a minute to grab a few shots of one of my favorite subjects, too. Finally, remember to have someone take your picture. (Yes, you can take a selfie, but…) There are plenty of friendly people in this world, and a lot of them will be right up there with you on the top of that volcano. My best advice: find a mom. Moms get left out of pictures a lot, so whenever I see a mom taking a picture of her family, I make a point of asking if I can take the picture so that she can be in it too. Nine times out of ten, she will flash me a Mom Club smile [First rule of Mom Club] and it makes my day. 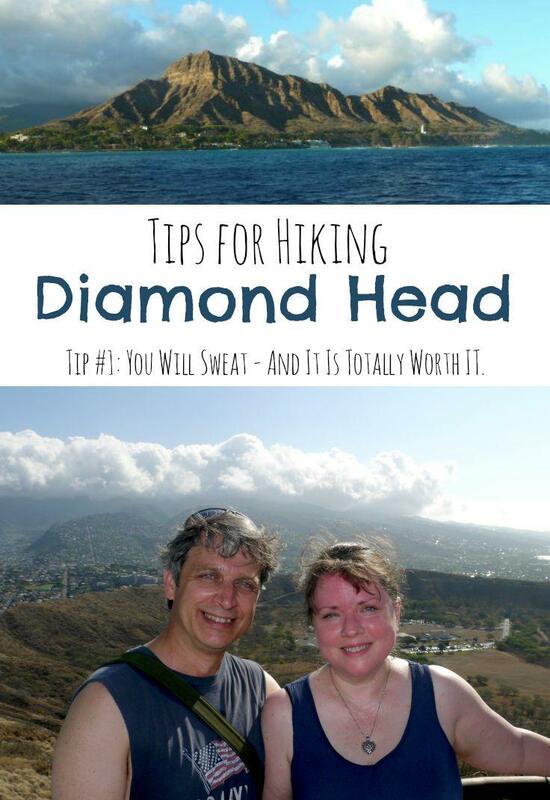 That’s about it, so I’ll end where I started: If you have the opportunity to climb Diamond Head, do it! You will sweat – and it is totally worth it! 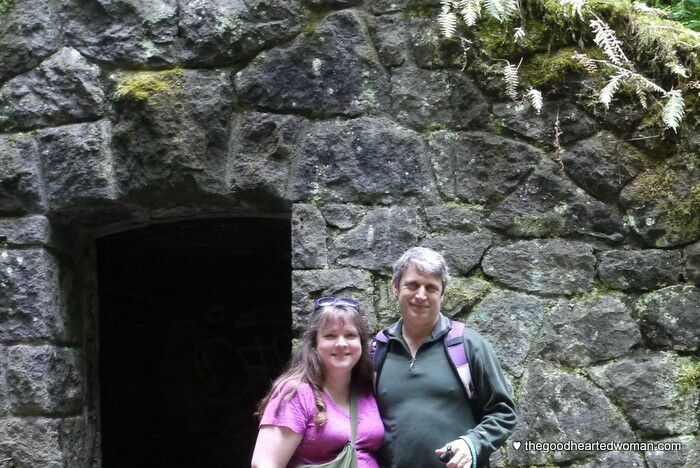 We decided to wrap up our Valentine’s weekend trip to Hood River by stretching our winter-weary hiking legs with a trip up to see the historic Twin Tunnels just west of Mosier, Oregon. 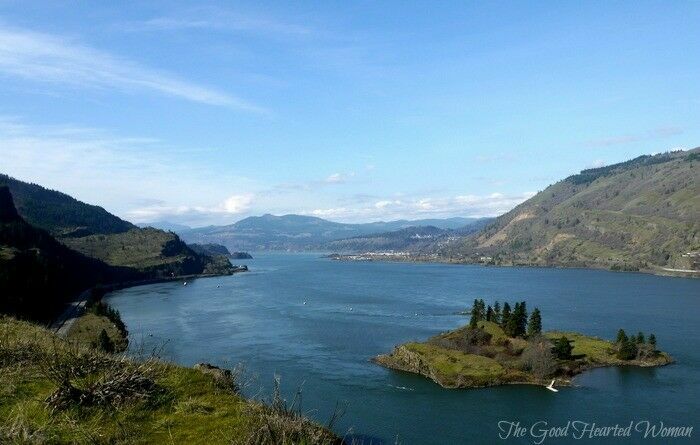 Really more of a stroll than a hike, this short 1.1 mile jaunt (one way, from the Mosier-side trail-head) offers some fabulous views of the Columbia River Gorge. 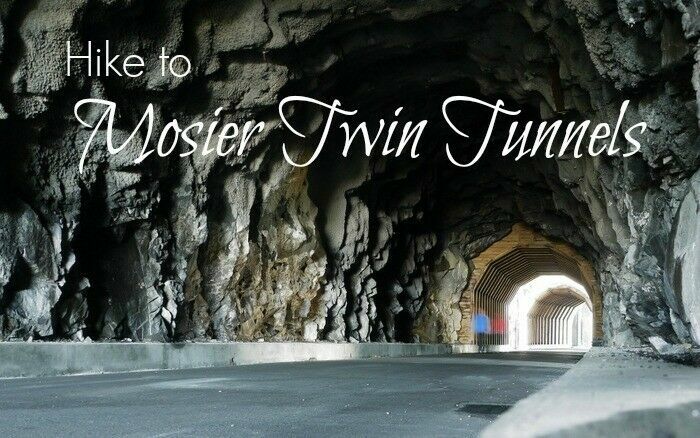 Once an important link in the scenic Columbia River Highway, the Mosier Twin Tunnels were constructed between 1919 and 1921. 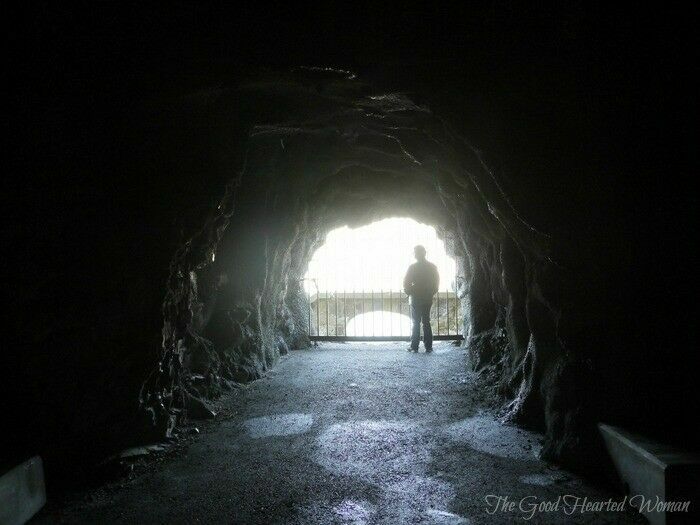 From the beginning, the tunnels and the nearby cliffs presented a trouble spot on the historic highway: rockfalls were common and accidents happened frequently. 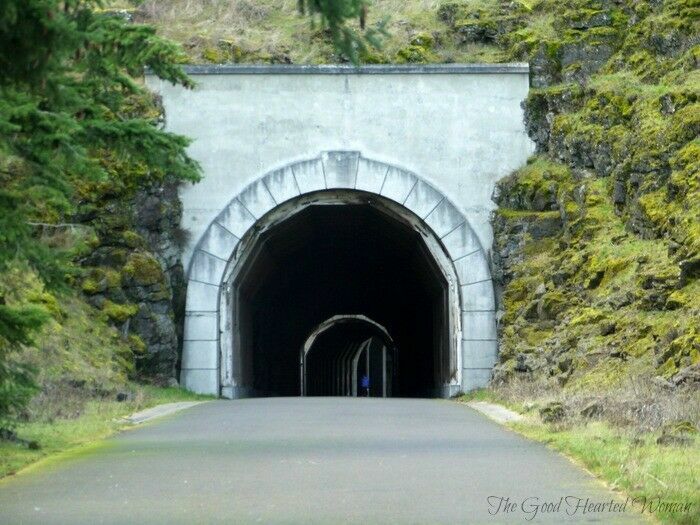 Eventually abandoned in 1955 after the completion of Highway I-84, the tunnels were soon filled in with rubble and forgotten. Then, in the 1980’s, interest in restoring the old historic highway began to develop. 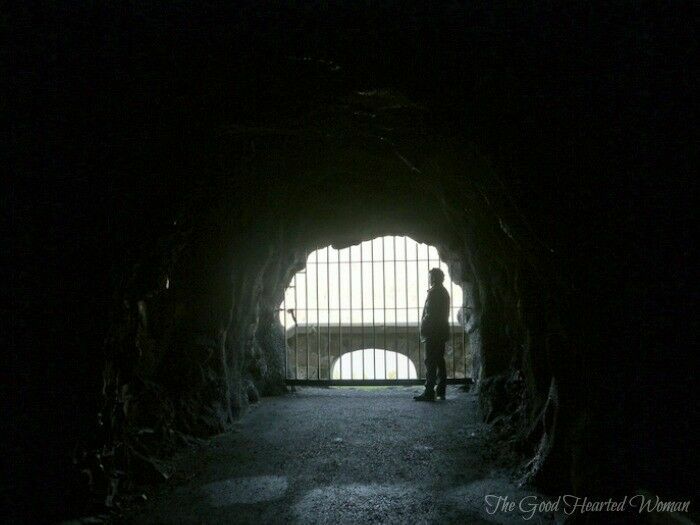 In 1995, with help of longtime Oregon Senator Mark Hatfield, work was begun to reopen the tunnels for tourist use. 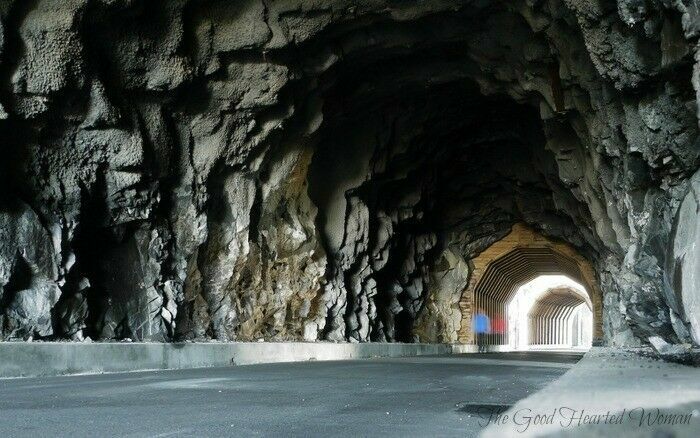 Rubble was removed from inside the tunnels, the walls were rebuilt, and the road was completely resurfaced. 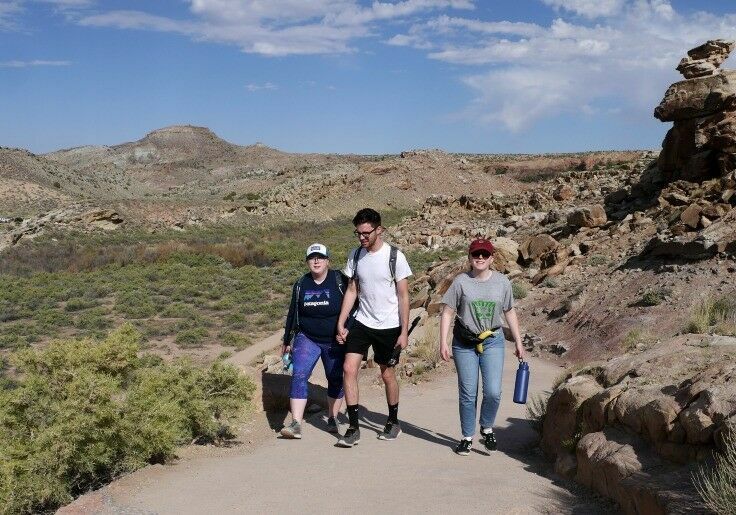 The hike itself is mostly flat, with just a slight elevation change, and paved, making it a smooth ride for cyclists and wheelchair hikers. I don’t know if it is always this way, but on the day we went, cyclists outnumbered walkers nealry two to one. 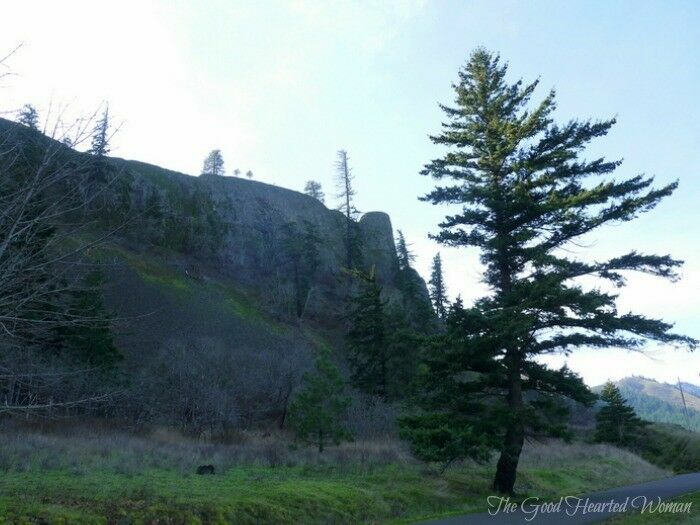 Hiking in from the Mosier side, the trail soon comes to the edge of the Gorge and turns west. Here, you’ll walk past stone guardrails and look down to a great view of Eighteen Mile Island, known locally as Chicken Charlie Island. This 10-acre island, once owned by one Charles Reither, was significantly larger before the completion of Bonneville Dam in 1937, and was home to a chicken ranch and a small railroad. 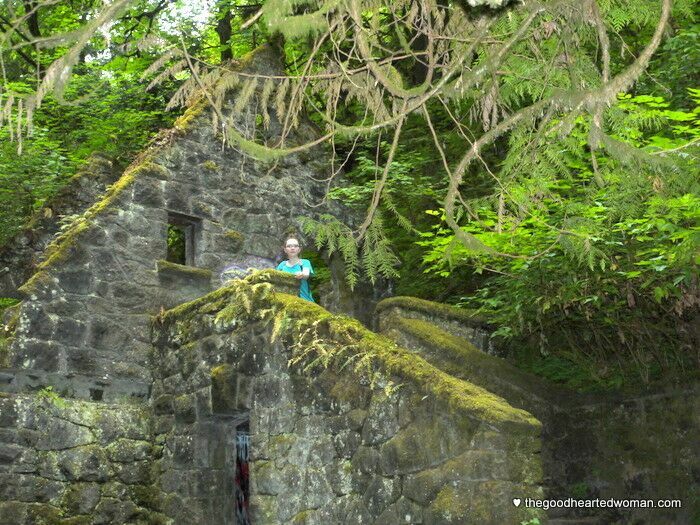 It is now the only privately owned island in the Columbia River Gorge. 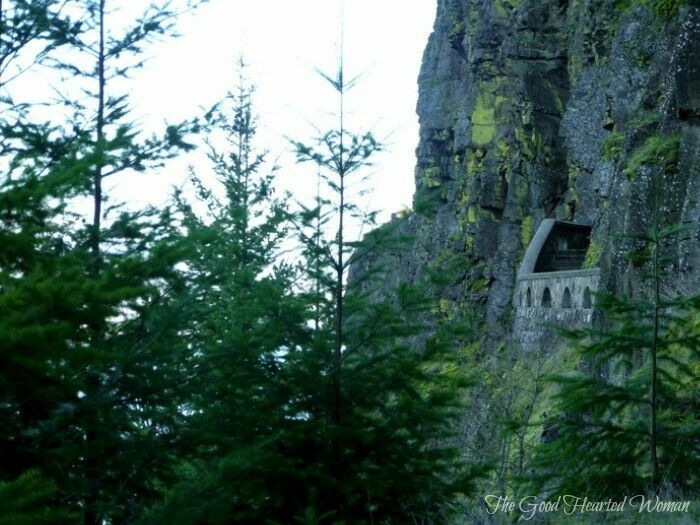 Just over a half mile into the hike, a beautiful new stone-walled lookout has been built over the Columbia River, and a short distance past the lookout is the east portal of the east tunnel. The entrance to the Eastern Portal has been restored to very much the same as it was nearly 100 years ago (pavement and cement curbs notwithstanding). 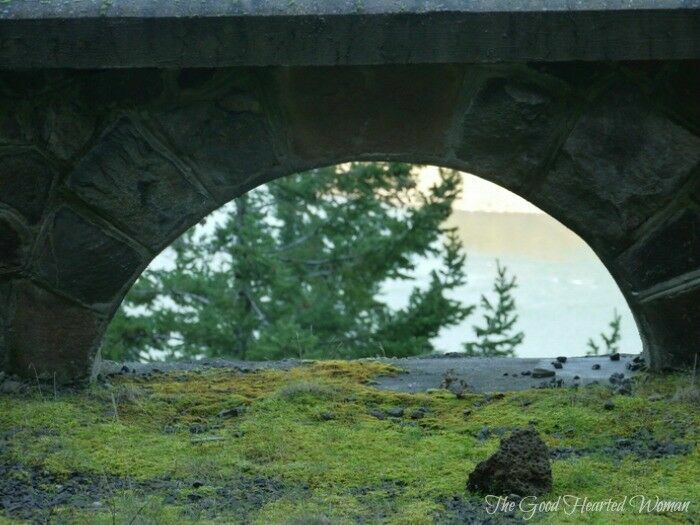 The second tunnel has two windows, known as adits, looking out over the river. There are steps that once led to viewpoints, but these are now blocked to the public. They make for some cool images though. 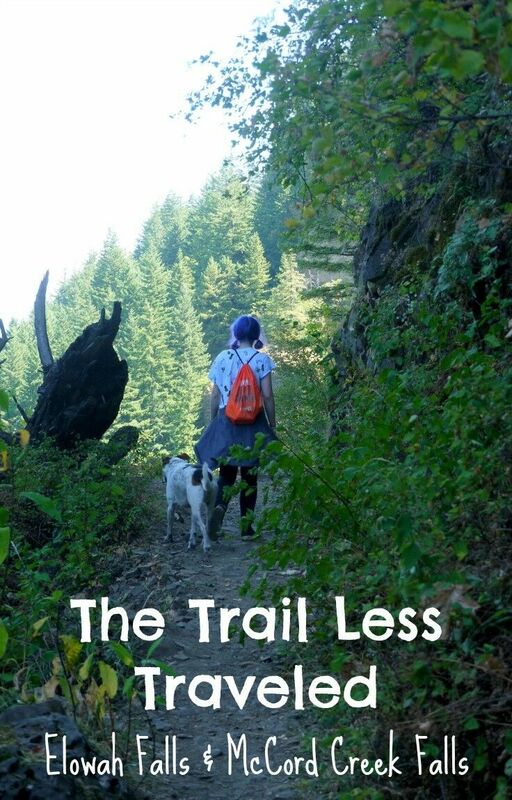 Beyond the tunnels, the trail continues another 3.5 miles to the Mark O. Hatfield West Trailhead, near Hood River. 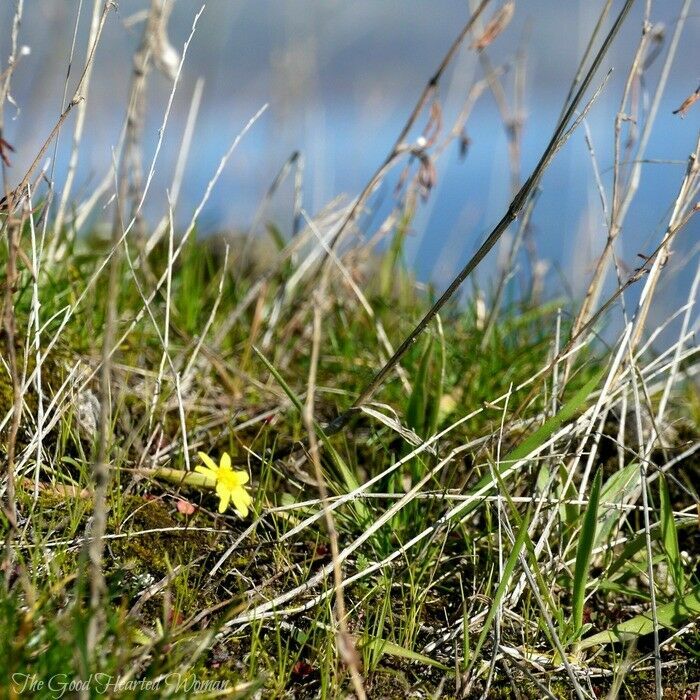 When we took this hike in mid-February, we were already finding the first signs of spring! This hike was a beautiful way to end our weekend, and a great way to kick off the hiking season here in the Pacific Northwest. 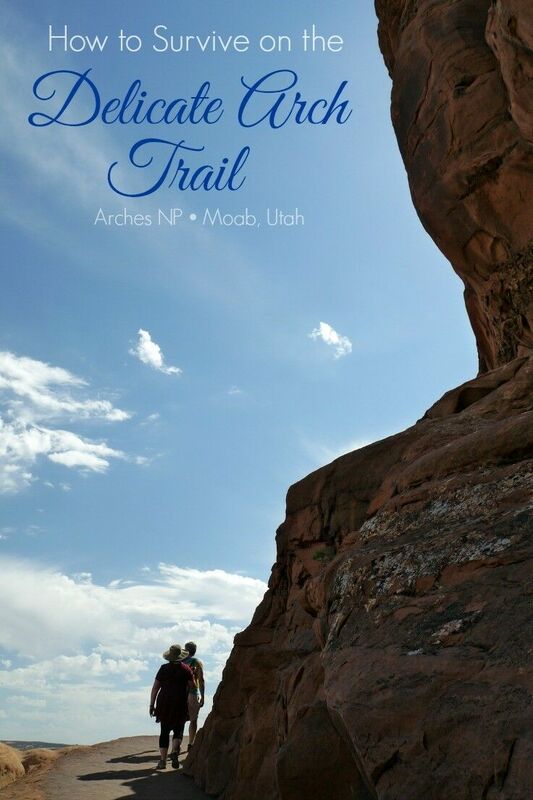 Hopefully we will see you on the trail soon! From I-84 take Exit 69/Mosier. 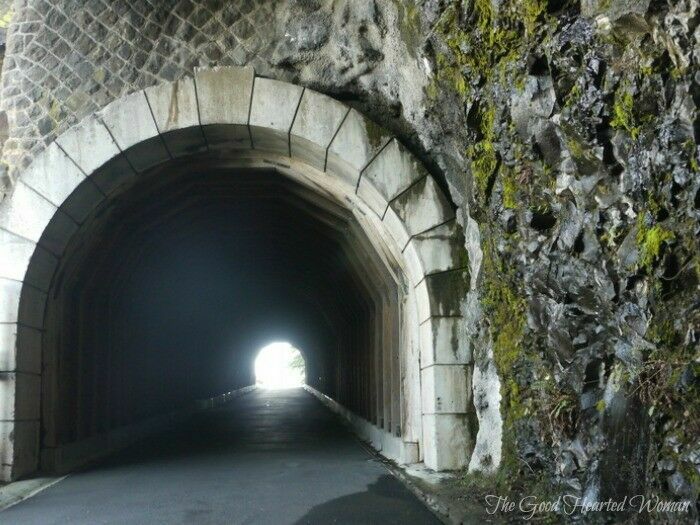 Follow the Historic Columbia River Highway as it curves left toward the town of Mosier. At the base of the bridge, turn left and circle under the bridge. Drive approximately 1 mile to the trailhead parking lot, which is clearly marked on the left. The actual trailhead is about a football field away from the parking lot. From I-84 take Exit 64/Highway 35, White Salmon & Government Camp. After exiting, turn right at the stop sign and then make another right turn. Head up for 0.4 miles to a four-way intersection and turn left toward the Historic Highway State Park. Wind up the hill for 1.2 miles and turn left into the parking area at Mark O. Hatfield Western Trailhead. 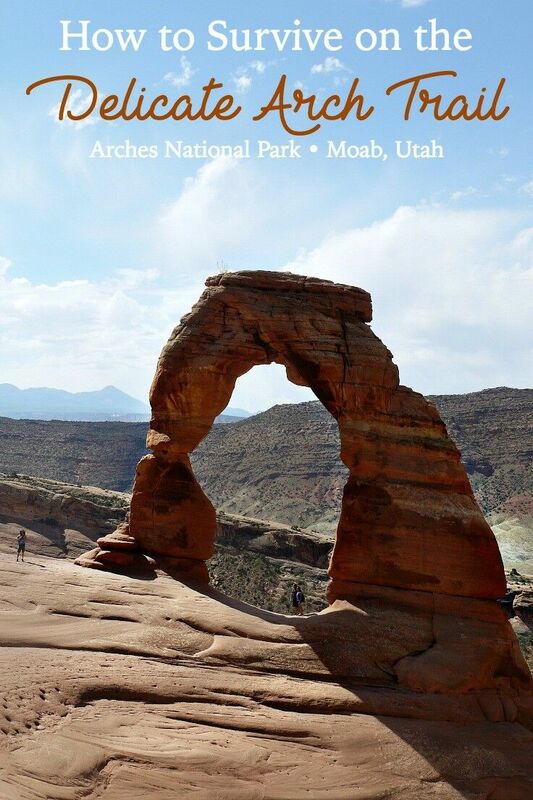 Curious Gorge – This is a limited online version of the book by the same name, listing 109 different Gorge hikes. In an effort to encourage readers to purchase the actual book, specific hike info is blacked out on this site, but it still gives you a lot of history about each hike, some lovely images, and a pretty good idea of what to expect. Cascade Ramblings – Nice maps and hike basics here. Before I detail the hike directions, a little history lesson is in order. 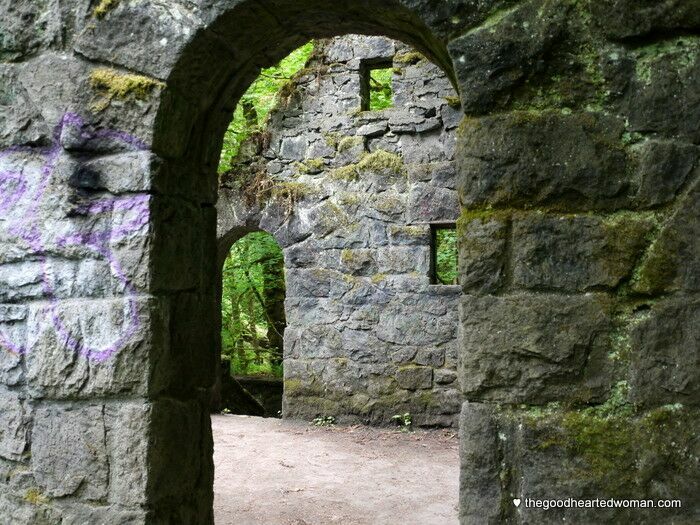 Forest Park has always been a hotbed of strange happenings in the Portland area, and Witch’s Castle is at the epicenter of one particularly haunting tale. It seems that back in 1850, one Danford Balch filed a claim on a parcel of land near the newly settled town of Portland. Danford needed some help clearing the land, so he hired a transient worker named Mortimer Stump. Balch invited Stump to stay with his family, which included his wife Mary Jane and their nine children, while the work was being done. Unfortunately, Stump ended up staying on a lot longer than was healthy for anyone. It seems that Stump eventually fell in love with 15-year old Anna Balch and asked for her hand in marriage. When Danford and Mary Jane refused, the couple threatened to elope, and Father Balch retorted that if they did, he would kill Mortimer Stump. Young love being what it is, Mortimer and Anna ran off to Vancouver and were married in the fall of 1858. Danford Balch would later claim that what happened next was the result of his wife “bewitching” him. The next time he encountered the couple, in Portland with other members of Stump’s family, a drunken Balch shot Mortimer Stump in the head. Balch was arrested, but escaped while awaiting trial. Finally arrested again six months later on his own property, he was tried, found guilty, and subsequently hanged in October of 1859, making Danford Balch the first (legal) hanging in the Oregon Territory. Mary Jane Balch, the “Witch” in our story, continued to live on the property. To this day, some attribute the strange occurrences at the Witch’s House to the ghosts of Danford, Mortimer, Anna, and Mary Jane. If that isn’t enough to intrigue your teen off the couch, I don’t know what is. Lamentably, the Witch’s House is not the actual Balch home. Over time, the Balch land was passed to various owners, and was eventually given to the City of Portland by Donald Macleay in 1897 to be used as a park. 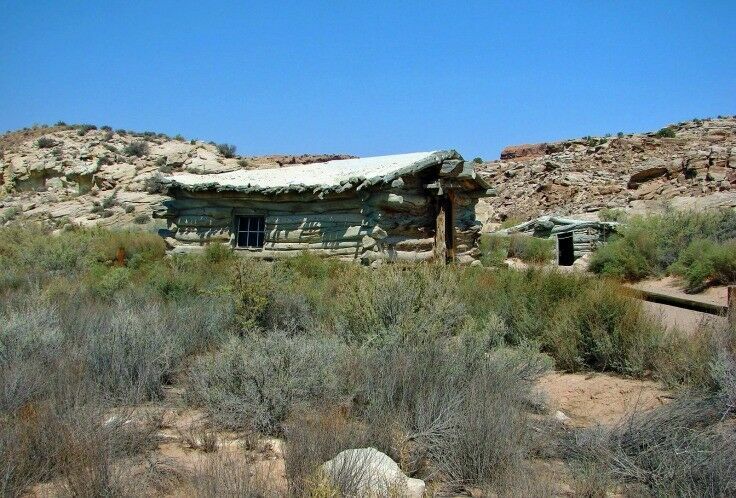 In the 1950’s, a stone ranger station and restroom was constructed near the old Balch place, but was soon abandoned and quickly deteriorated. 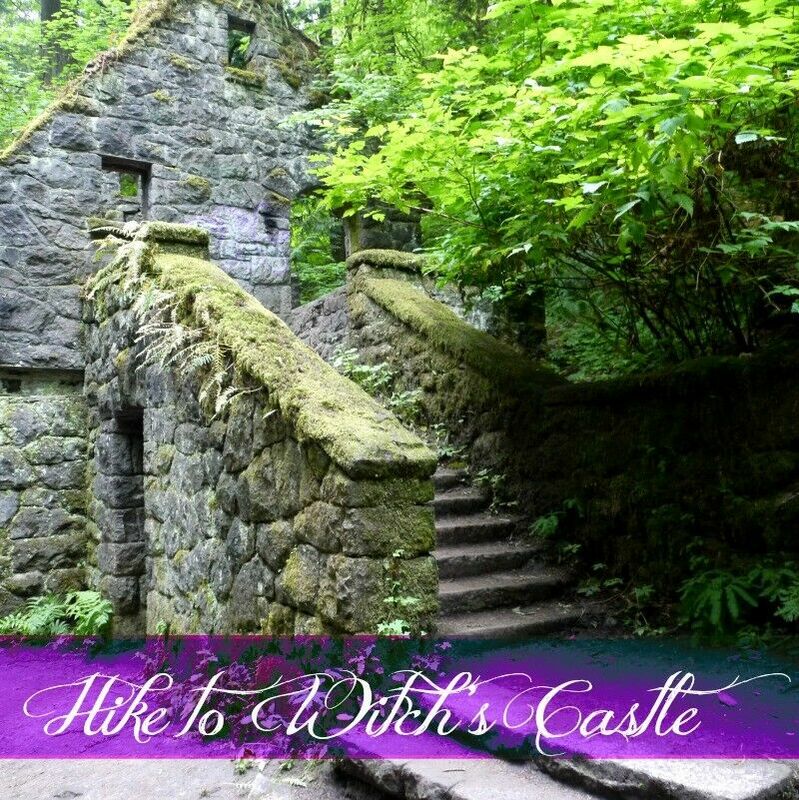 It is that stone structure that stands today as the Witch’s House. 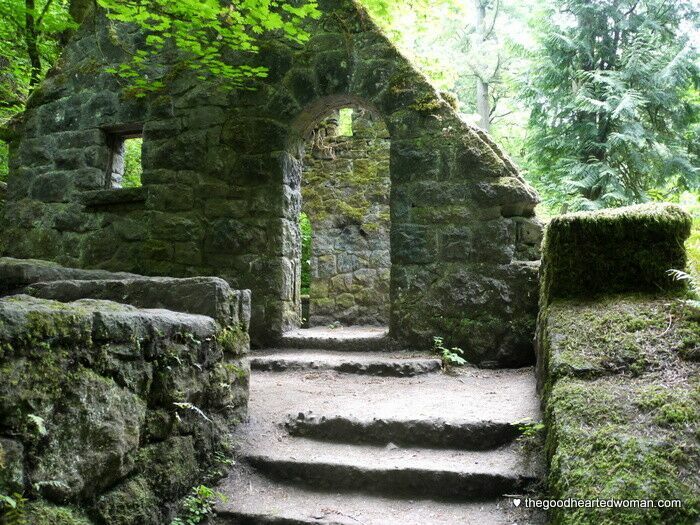 How to get there: The Witch’s House is an easy half-mile hike from the Upper Macleay Parking lot near the Portland Audubon Society, or a slightly longer three-quarter mile jaunt starting from the Lower Macleay Parking lot at at NW 30th and Upshur. If you want to visit the Audubon Society first, as we did, you can pick up the trail just to the right of the Wildlife Care Center, and then the only turn you’ll make is a quick left onto the main trail. 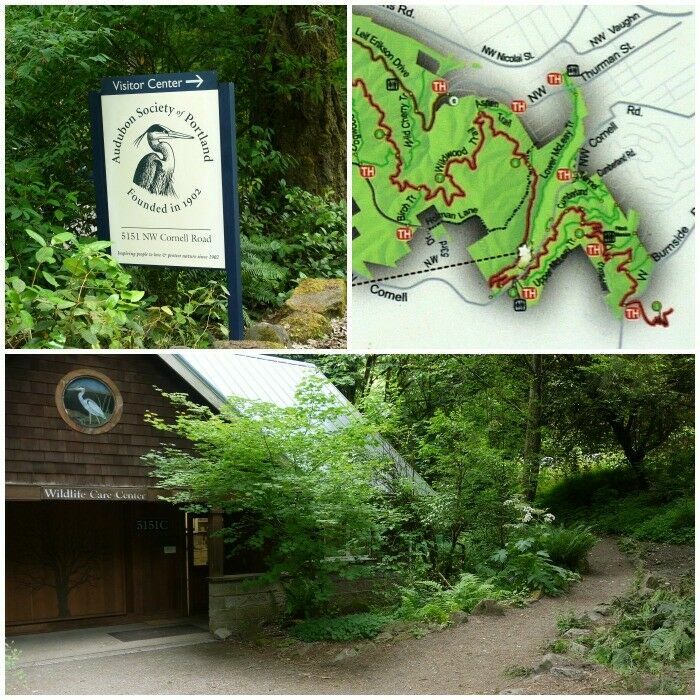 It’s an easy twenty or so minutes walk the hike in from Upper MacLeay, following Balch Creek on the Wildwood Trail. As a Portland native, I take that as a real compliment. P.S. About the picture above: I’m pretty sure I’m not really that short. 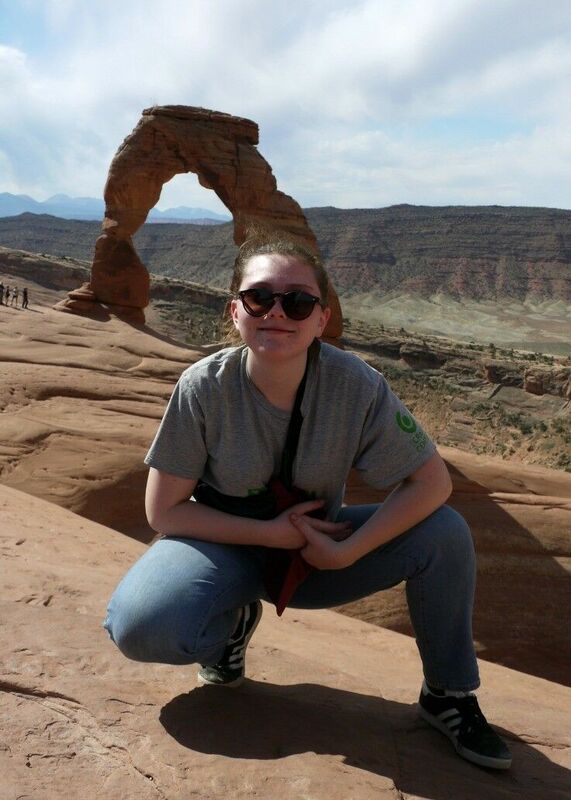 I’m almost positive I was standing in a hole. Or something.